Hello again! So I have decided to do another recipe from the YOU Magazine extra full of Mary Berry recipes as the last one went down well. This one is a scrumdiddlyumptious chocolate and ginger cake – perfect for this sort of weather with just a hint of spice mixed with indulgent chocolate. You can also find this recipe online if you search the recipe name (again, here it is on the Sainsbury’s website). I started by lightly greasing the sandwich tins with a little butter and then lined the bottom of each with greaseproof paper. I prepared my ingredients by weighing them out and setting aside until I needed them. I made sure to pre-sift the flour and baking powder together. I also made sure to chop the ginger as finely as I possibly could, but you could also use a small food processor to do it quickly. I preheated the oven to 160°C for my fan oven (180°C/Gas4 for other ovens). 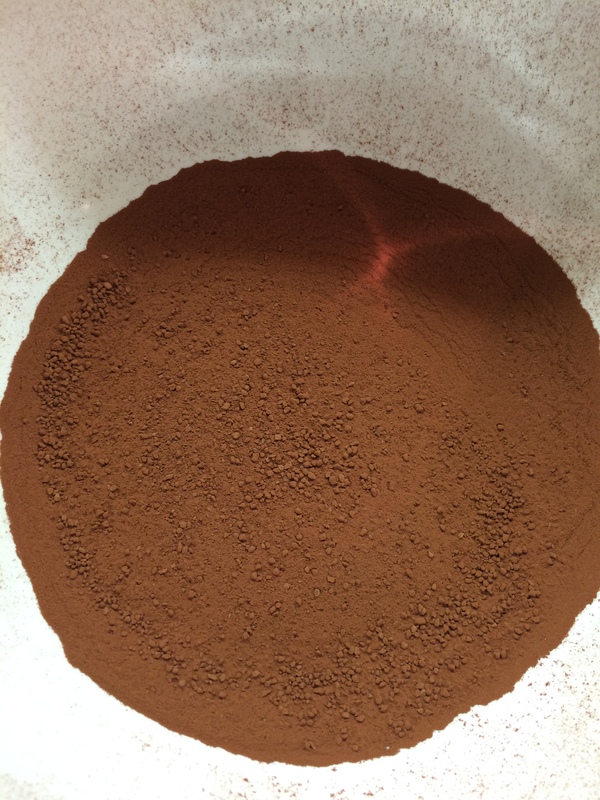 In a large heatproof bowl, I sifted in the cocoa powder and then added 6 tbsp of boiling water and stirred until there were no lumps. 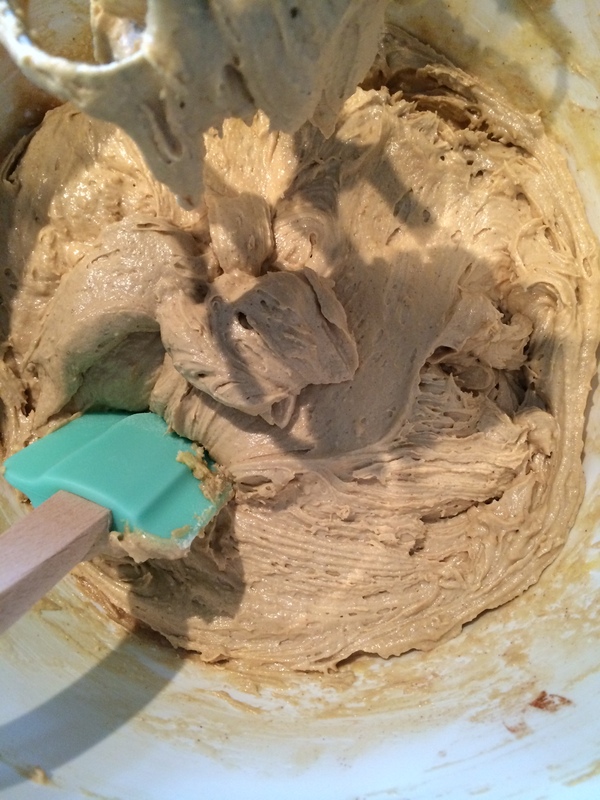 I then added the milk and stirred until it became a smooth paste. 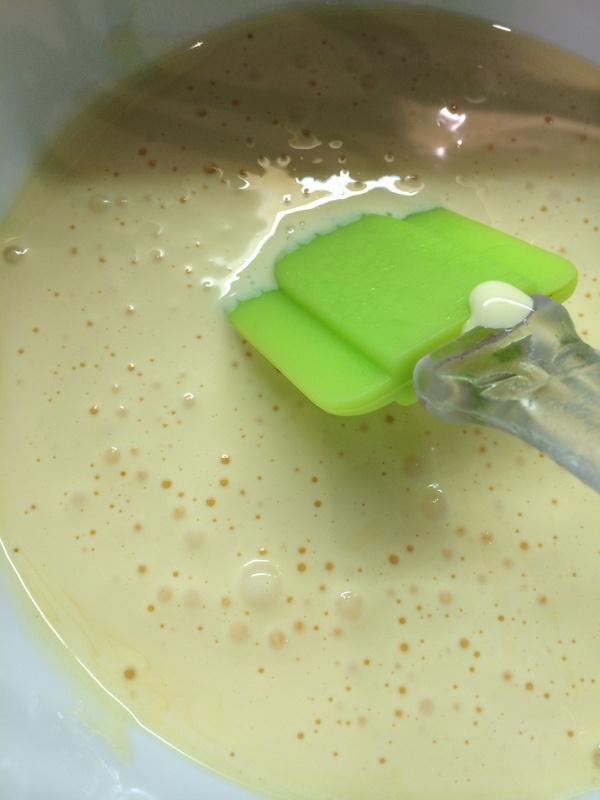 I added the remaining cake ingredients and with my electric hand whisk, I mixed the ingredients for 1 -2 minutes (be careful not to over-mix the ingredients as the cake might not rise properly). I divided the cake mixture between the cake tins and made sure to even out the tops before placing them in the oven and baked them for about 25 – 30 minutes. 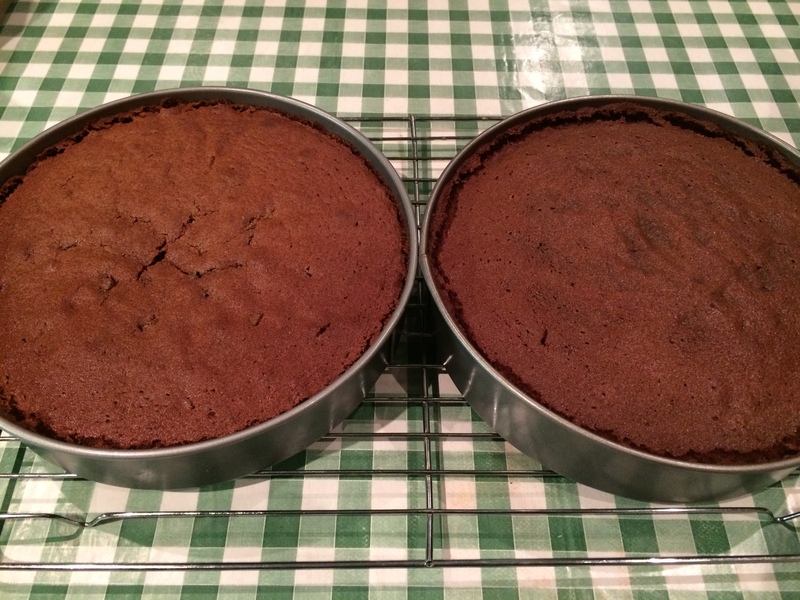 I took the cakes out when they were done and left them to cool a little in their tins before turning them out gently and peeling off the paper and then turning them the right way round on a cooling rack. 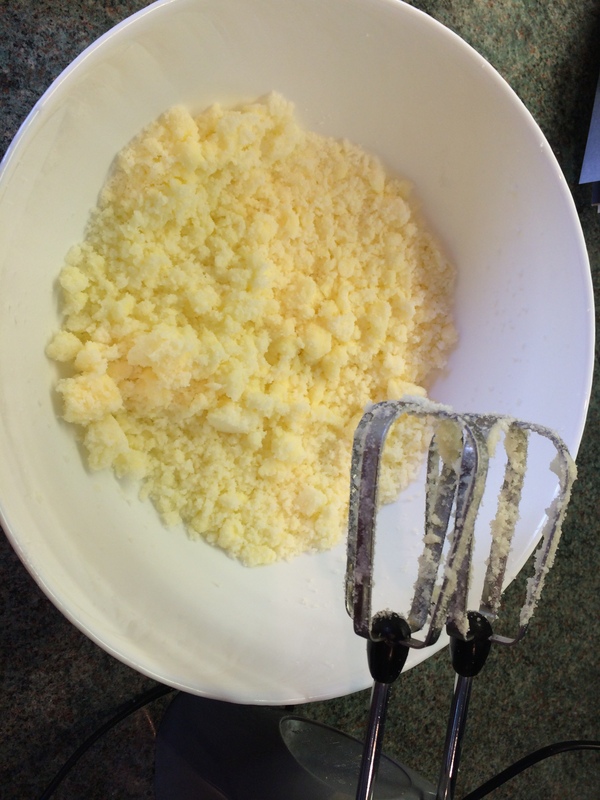 I then started to make the filling and topping by sifting the icing sugar into a bowl and adding the butter, syrup and milk. I usually just mix using a wooden spoon, as using an electric whisk means that I end up covering the kitchen in icing sugar. 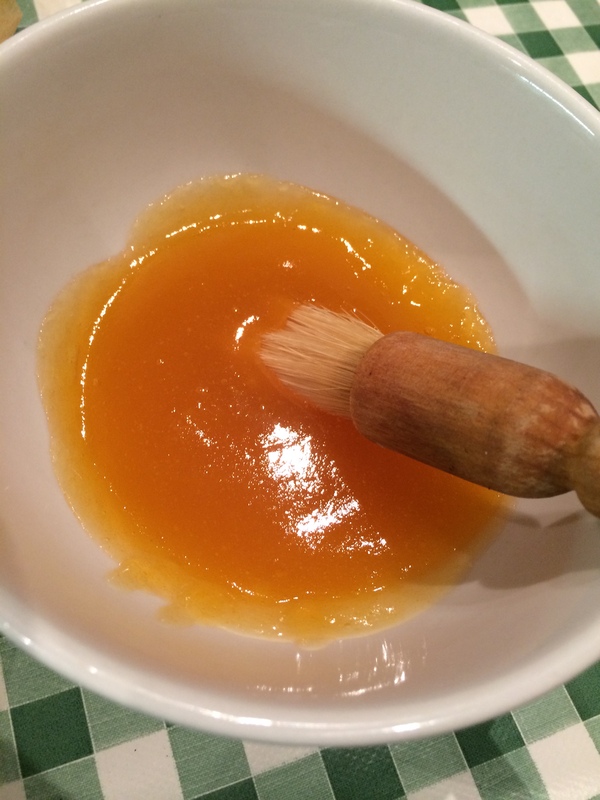 It does involve a little more graft but I usually sit the bowl in my lap and watch TV while I mix – makes it easier! I transferred one of the cakes onto a serving dish and put half of the icing on top and smoothed it over evenly with a palette knife. Then I placed the second cake on top and added the the rest of the icing, and using the palette knife, I gave it a little texture. 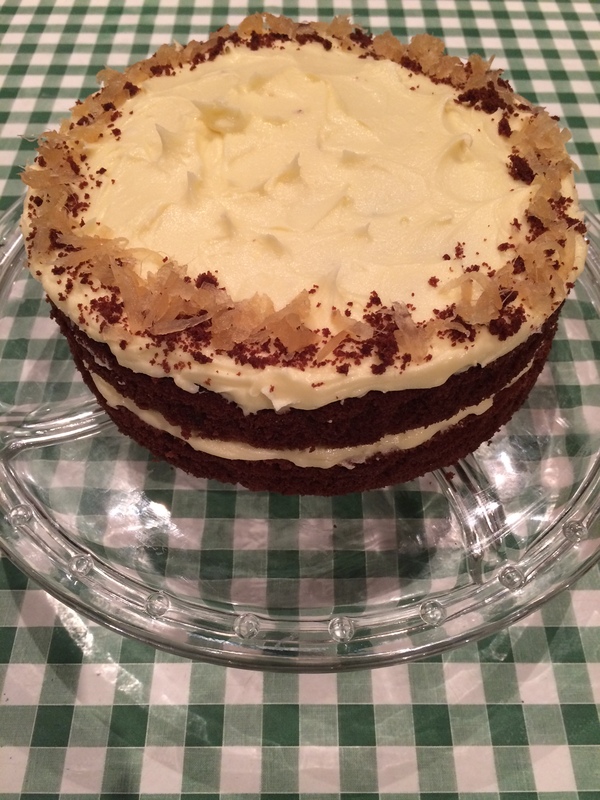 I then got the runaway cake bits from earlier and turned them into crumbs and sprinkled them around the edge of top of the cake before placing my shredded ginger on top for extra effect. Look how purdy it looks! 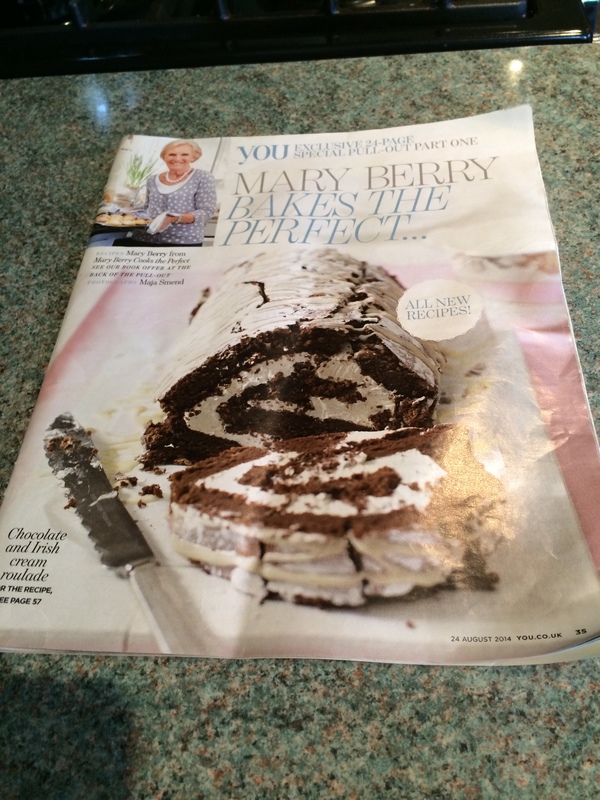 I LOVE Mary Berry recipes, I think she has some great ones to try so you should give one of them a go! The other thing I love about her recipes is that she normally includes some great baking tips that make your life a little easier and that you can apply to other recipes. A slice of this cake goes great with a cup of tea after a hard day’s work and makes for a yummy treat this time of year as the ginger adds such a nice kick of spice and sweet in one. 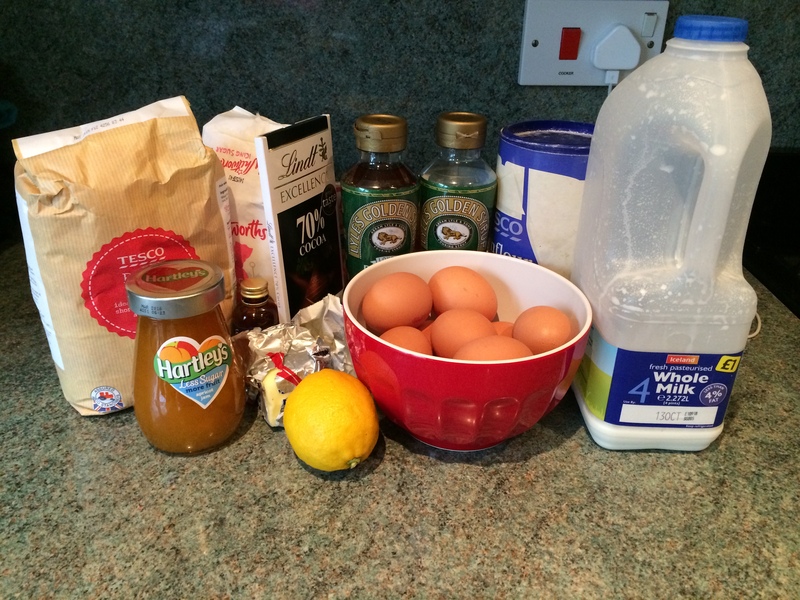 What are you favourite chocolate and ginger recipes – are there any others that I should try? Leave your comments below and don’t forget to like if you enjoyed this post (and follow me via the links on the right as well). I have been meaning to do this post for a little while but I was a bit over-run with seeing my two little munchkin nephews. They are adorable little troublemakers! My mum is a huge lover of apple-desserts so I thought I would go ahead and make this for her. 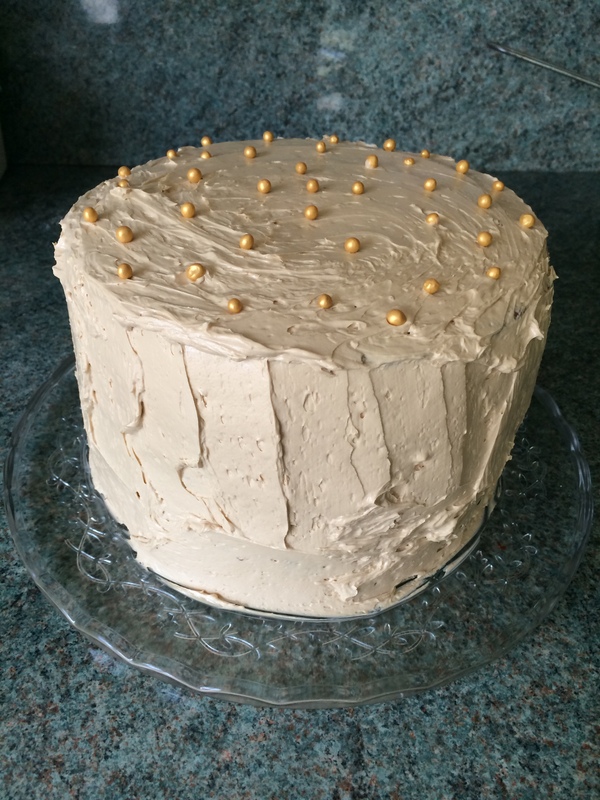 The recipe is from a special YOU Magazine extra full of Mary Berry recipes, so I thought I would give it a go! You can also find this recipe online if you search the recipe name (here it is on the Sainsbury’s website). 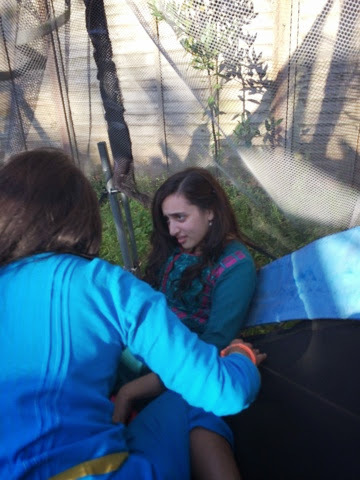 As my older sister, Farah was here I thought I would get her to help a little bit by asking her to start by greasing the tin with a little butter and to then line it with some greaseproof paper. 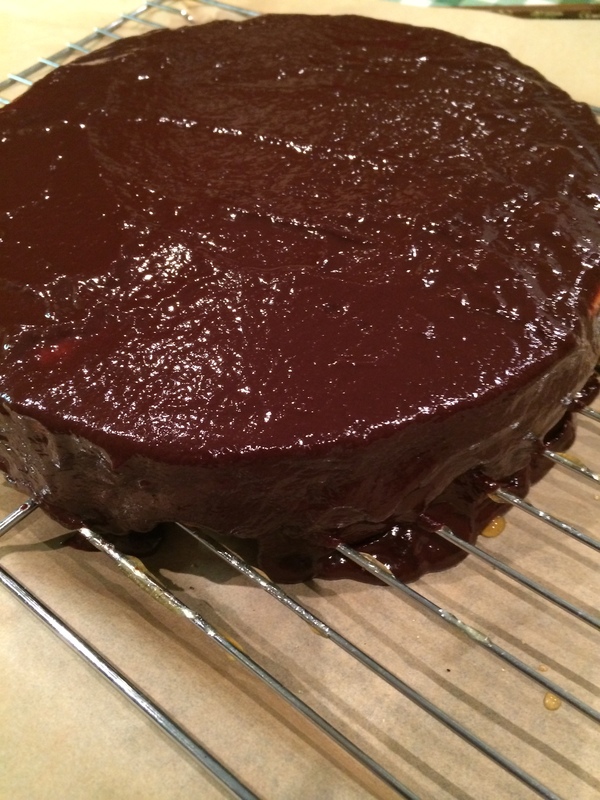 After greasing the tin a little too much, I think she finally got there – doesn’t it look pretty. 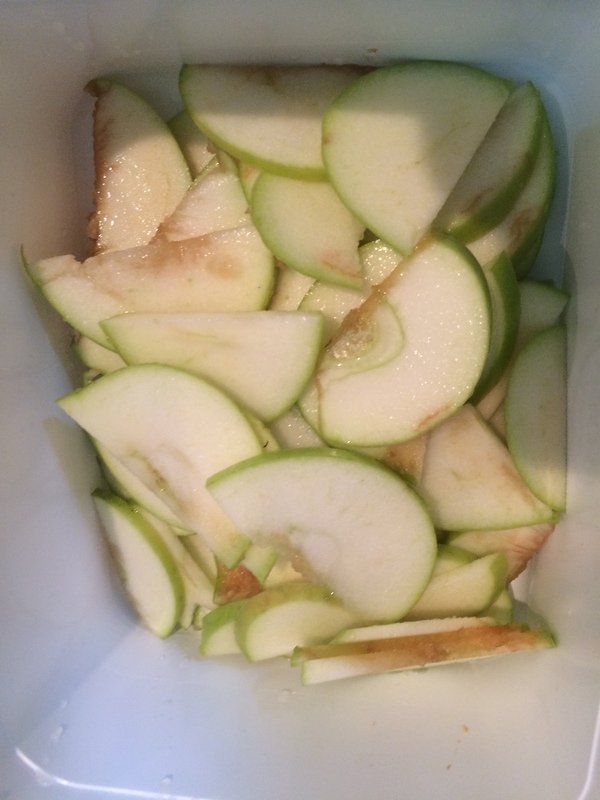 I started by coring the apples and chopping them into quarters and then slicing them finely. I then added them to a tub and added the lemon and made sure all the slices were covered. 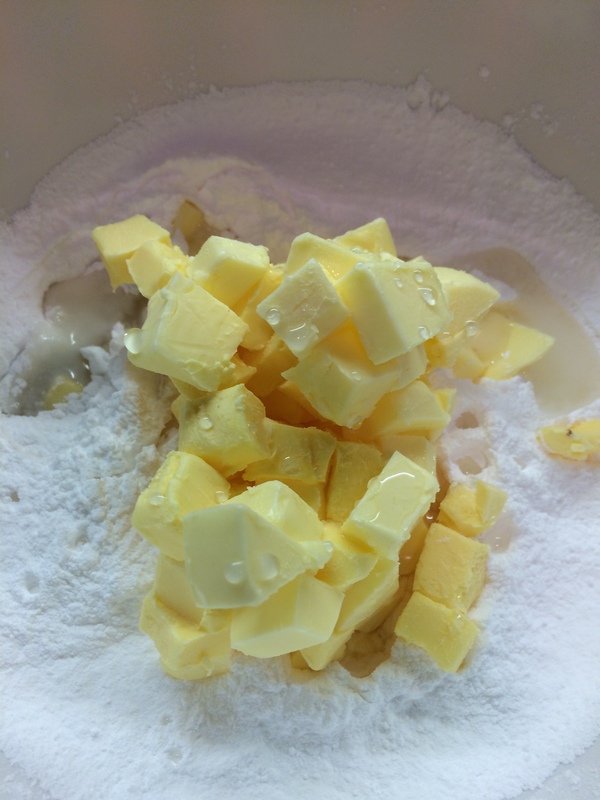 I added the butter, sugar, flour, baking powder, ½ a teaspoon of the cinnamon, the eggs and milk into a bowl and then whisked until all the ingredients were incorporated and the mixture was smooth. 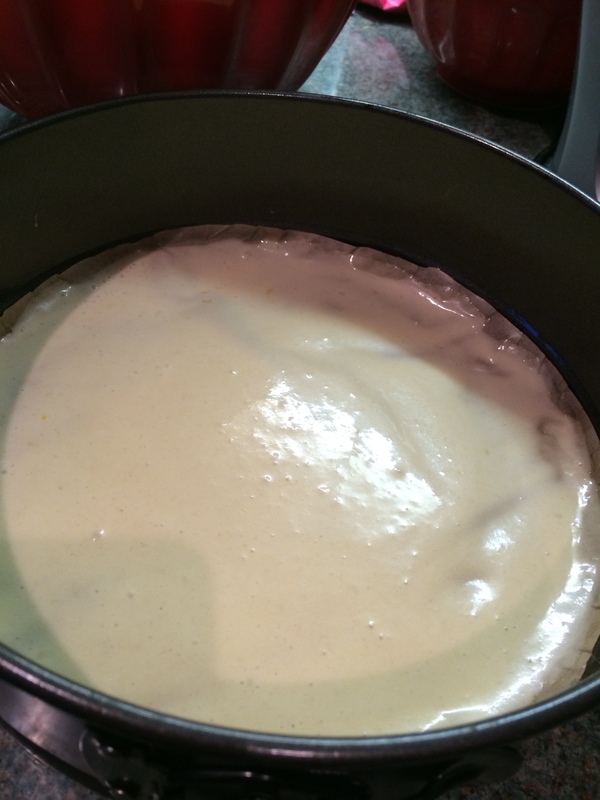 At this point, I preheated the oven to 160°C (as stated in the recipe for fan ovens). 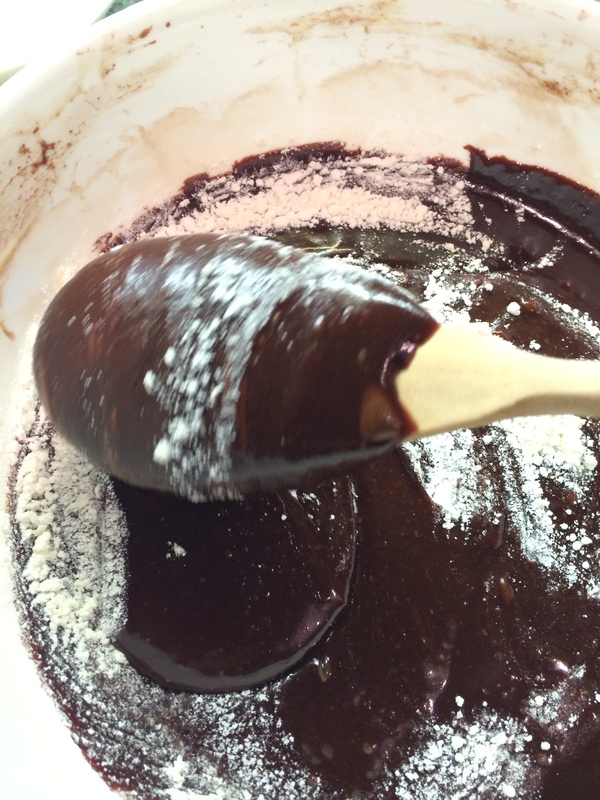 I spooned half of the mixture into the tin and using a spatula, I made sure to spread the mixture evenly. 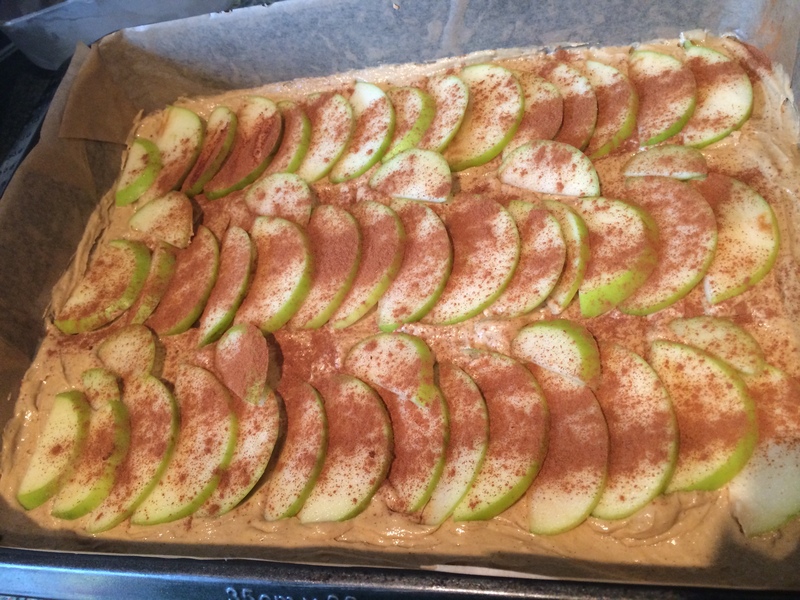 I then added half of the apple slices on top and then sprinkled over the remaining ½ teaspoon of cinnamon. I then added the rest of the mixture to the tin, and very carefully levelled it out without disturbing the apples underneath. Finally I added the other half of the apple slices on top and made sure to gently press them into the surface. 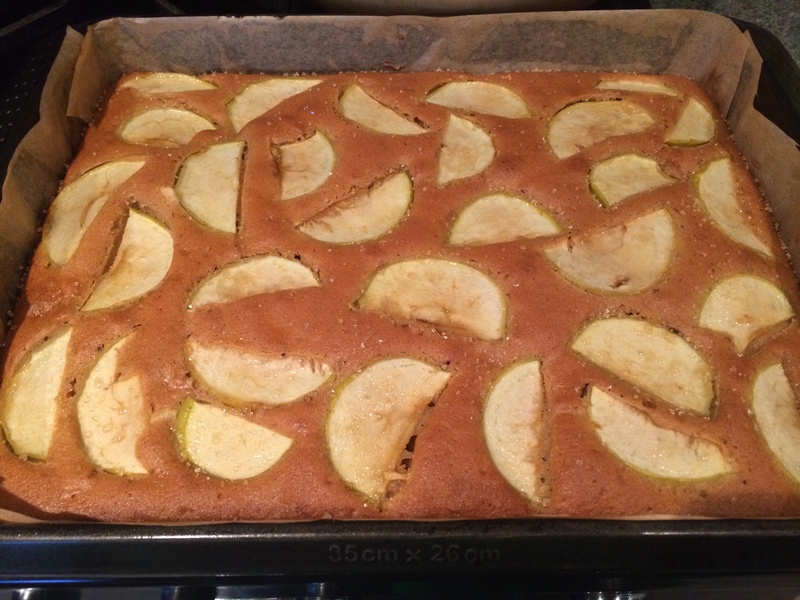 I put the tray into the heated oven and cooked it for about 25 – 35 minutes, or until it turns golden brown and the cake is firm but spongy to touch and the apples are soft. And as a last minute touch, I sprinkled some brown demerara sugar over the top, concentrating over the apple slices and put it back in the oven to caramelise a little. I left it in the tin for about 20 minutes until the cake had cooled down enough for me to take it out of the tin and place on a cooling rack. This was a wonderfully easy and delicious recipe to make (compared to my usual recipes anyway) and it went down well with my family. 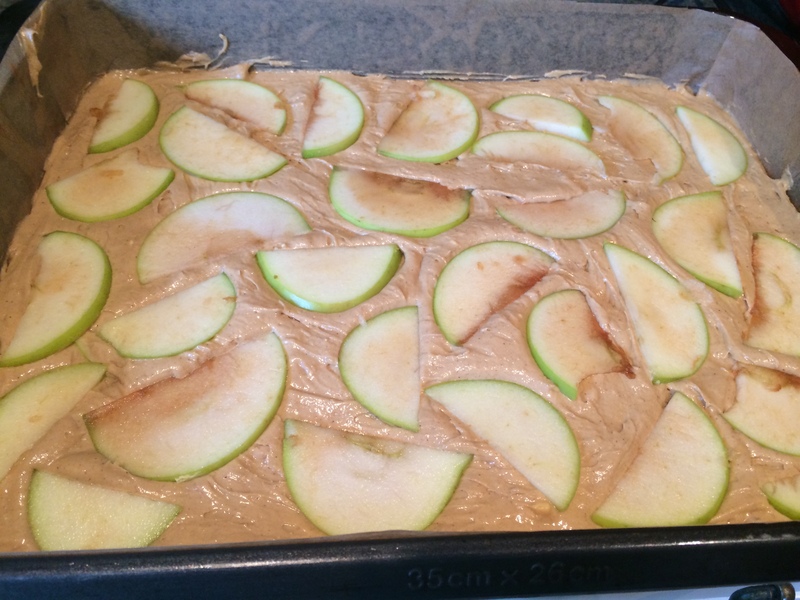 It was only until I had cut the traybake into squares to serve, that Farah pointed out I hadn’t peeled the apples… OOPS! By the time we got to the dessert it had completely cooled down, so we warmed them a little in the microwave and served them with some Madagascan vanilla custard, ice cream or a little double cream depending on preference. 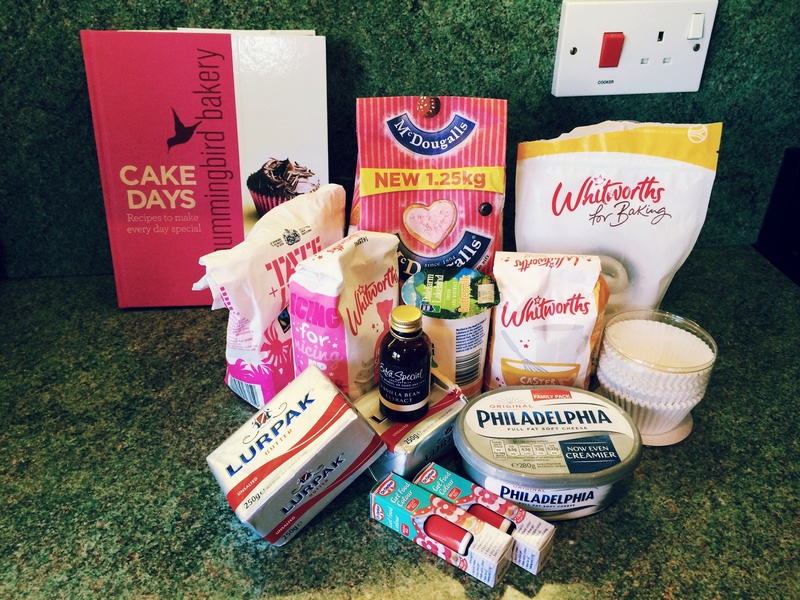 Have you ever tried some to bake any Mary Berry desserts, and if so, which ones have you tried? Don’t forget to comment below! 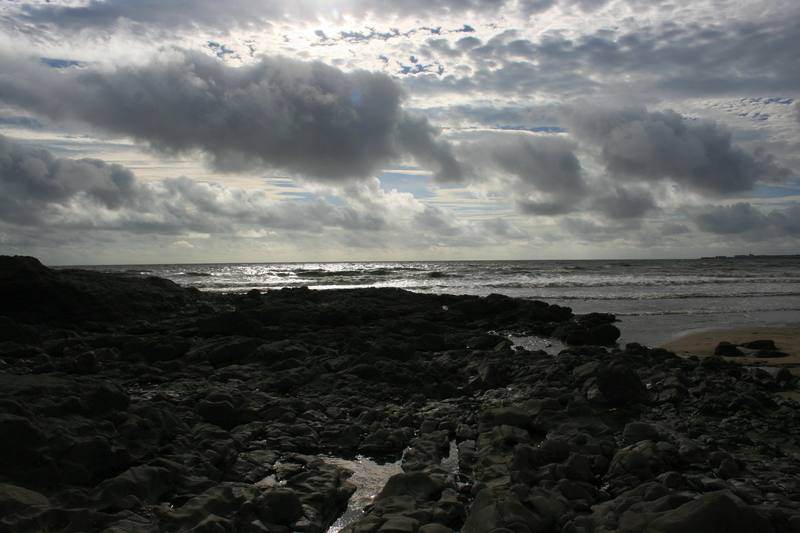 If you live in South Wales, then chances are you have been to Ogmore-by-Sea at least once. I used to come here with my family when I was a little girl, and my siblings and I would have hours of fun playing in the little rock pools and building sandcastles. Ogmore-by-Sea is a wonderful place to explore, and as you can see, I had quite a bit of fun fiddling around with the settings on the DSLR to try and capture some of the dramatic scenery that day. 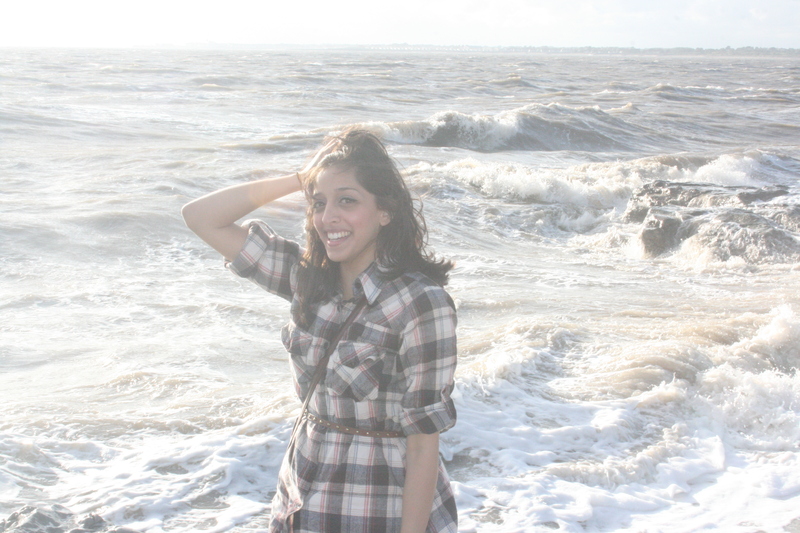 As beaches and sea fronts tend to go, it was a little more chilly than it was in Cardiff, even in summer, so make sure to wear an extra layer or two! If you have never been to Ogmore before, there are quite a few craggy rocks about before you reach the sand so sensible footwear is also a good idea (and not flip flops like I was wearing!). 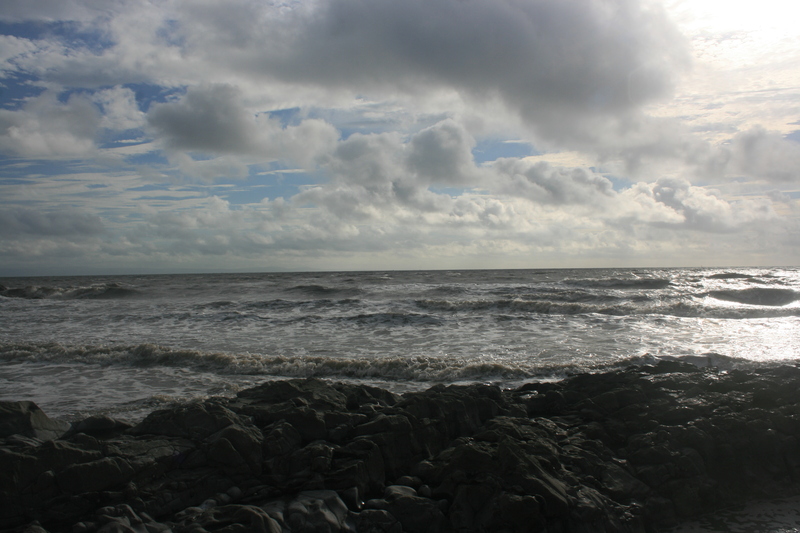 If you couldn’t already tell, it was a VERY windy day at Ogmore. Although the pictures I took that day concentrate on the beach, there are actually quite a few different activities you could do in the area such as trails and walks, pony trekking (check out Ride on the Beach) and if you’re brave enough – swimming! 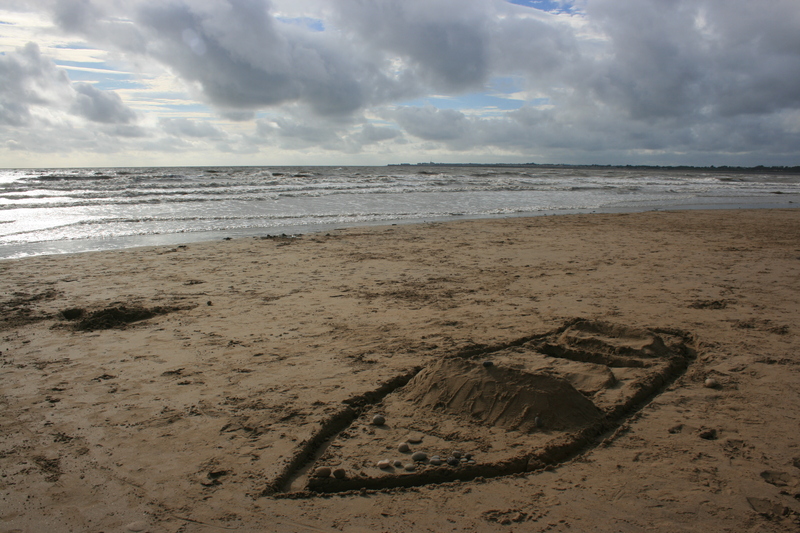 There are also two castles in the area to explore, Ogmore Castle and Candleston Castle. There are also a few places to eat, namely a lovely little country pub called The Pelican in her Piety which offers up hearty home cooked food – just what you need after a long day exploring. However, nothing beats watching the sun slowly sinking in the horizon whilst you’re wrapped up in warm layers a few blankets and a little picnic. A great day out for all the family (and the dogs!). 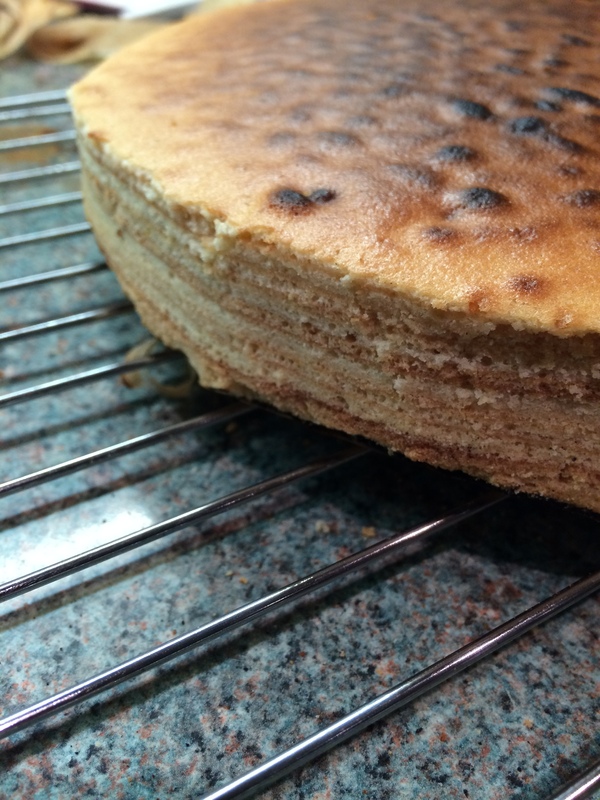 So, I was actually deliberating on whether I was going to share my latest bit of baking with you lot because I was actually very disappointed by the results (as I am a bit of a perfectionist) but hey ho, here is my attempt at trying out a schichttorte (yes, that 20-layered German cake from The Great British Bake Off). 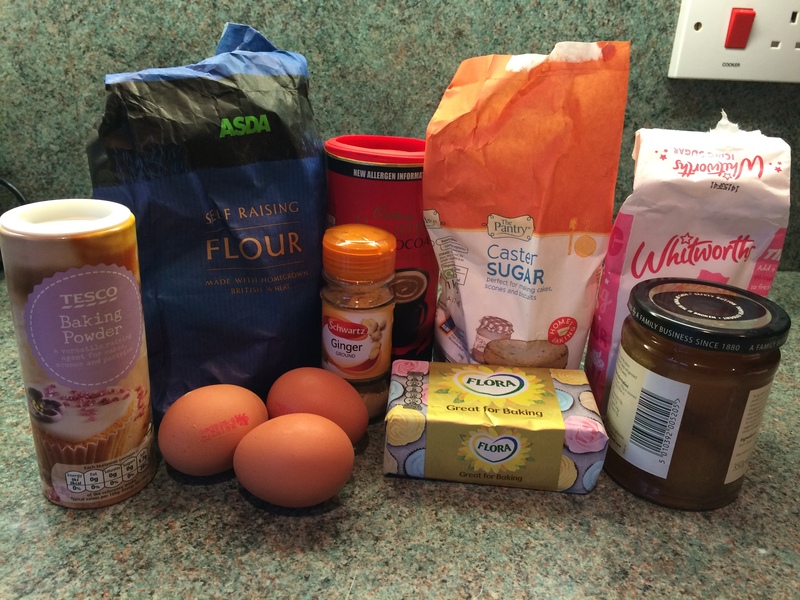 This recipe is from Paul Hollywood and can be found on the BBC – Food Website. 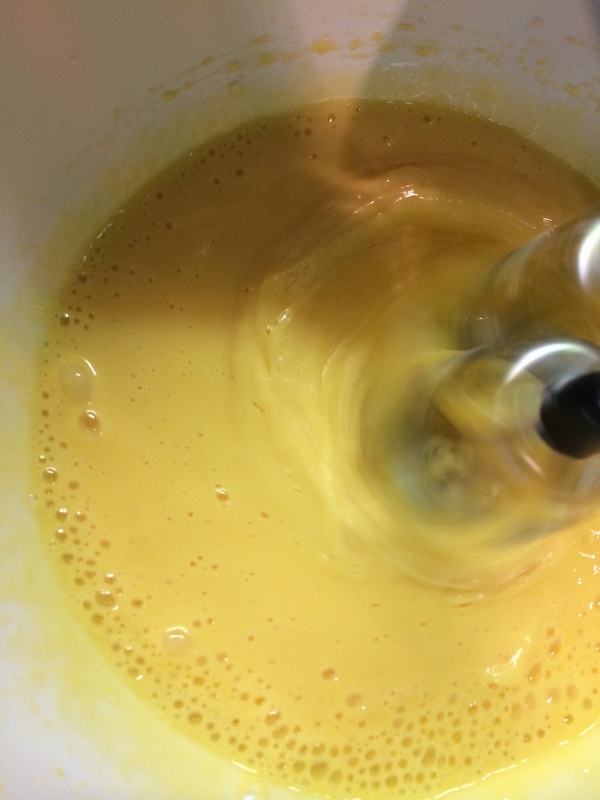 After I managed to separate all 10 eggs after a little bit of difficulty, I then whisked the egg yolks using a hand-held whisk on high speed until the mixture became pale, thick and creamy. 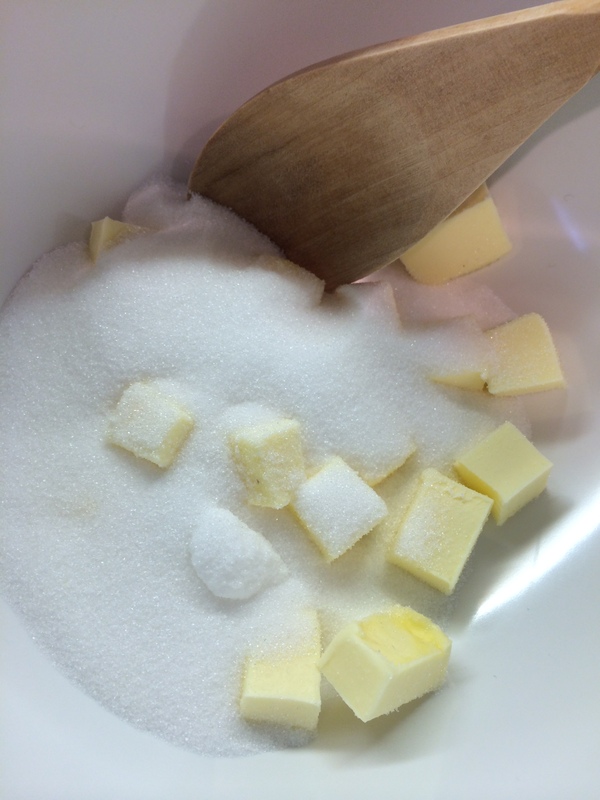 In another bowl, I creamed together the butter and sugar until pale and creamy. 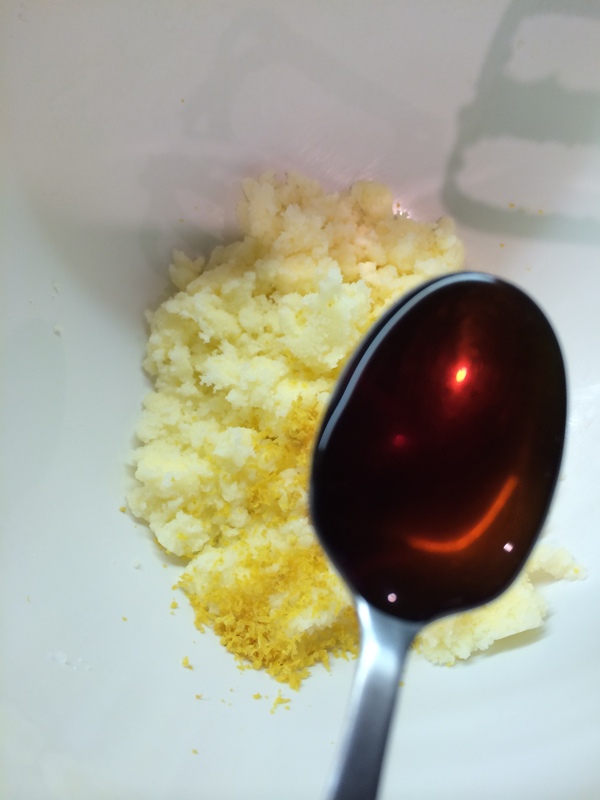 I then added the zest of one lemon and 1 tsp of vanilla extract (but you can use vanilla bean paste if you have it) and mixed well. 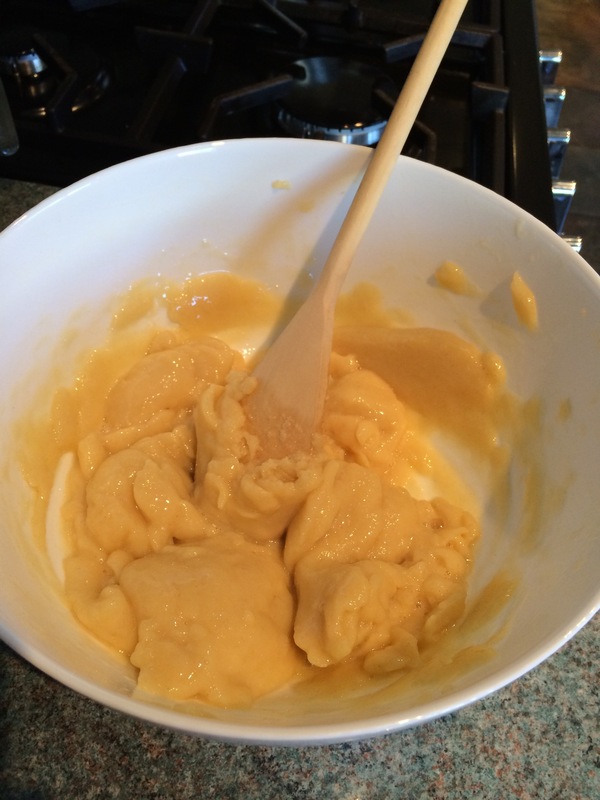 I added the whisked egg yolks and mixed well. 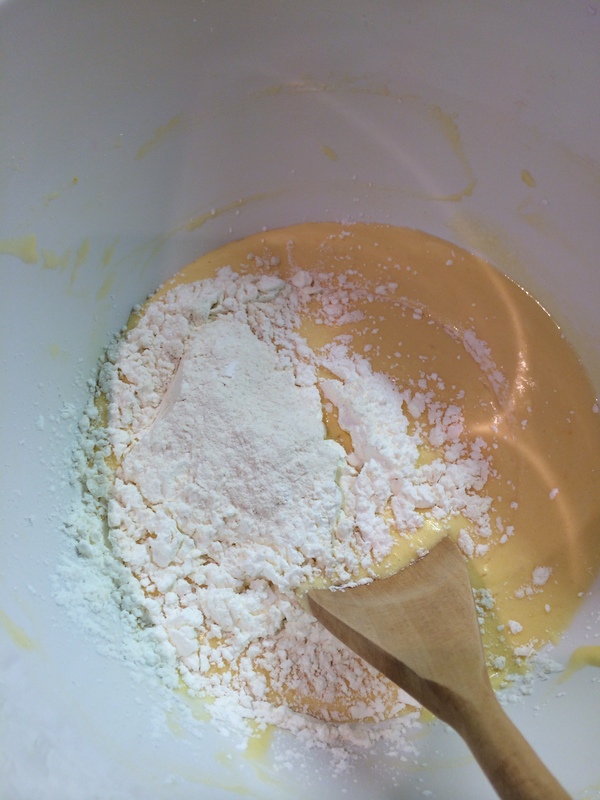 I then added the flour and cornflour (which I sifted together beforehand) in installments to make it a little easier to mix. 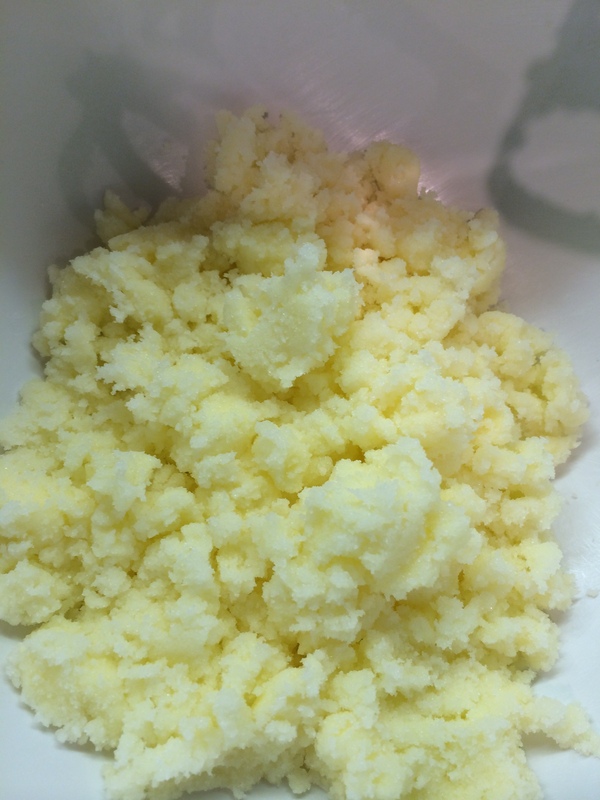 In yet another bowl, I whisked the egg whites until soft peaks formed. 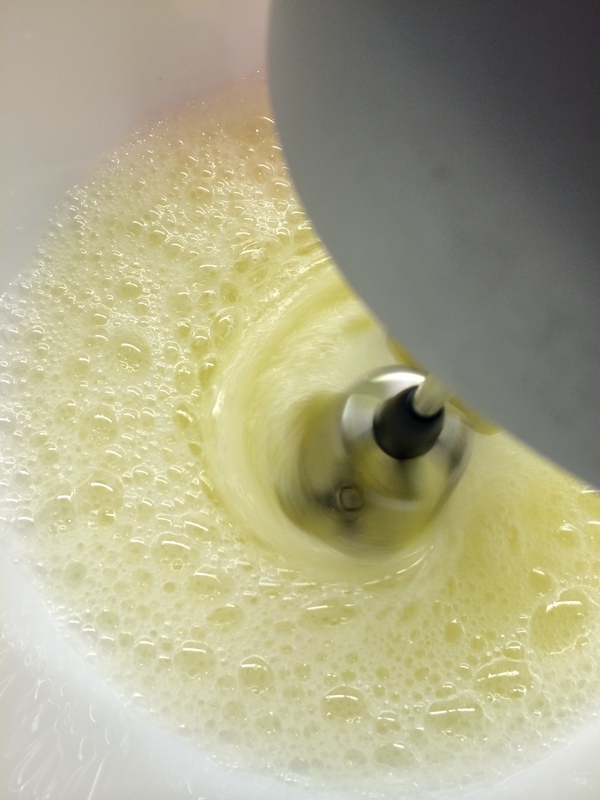 I stirred one-third of the egg whites into the batter to loosen it a little and then I gently folded the rest of the egg whites into the batter. I preheated the grill to high and then greased a 20cm/8in round springform tin with a little oil and lined the base with greaseproof paper. 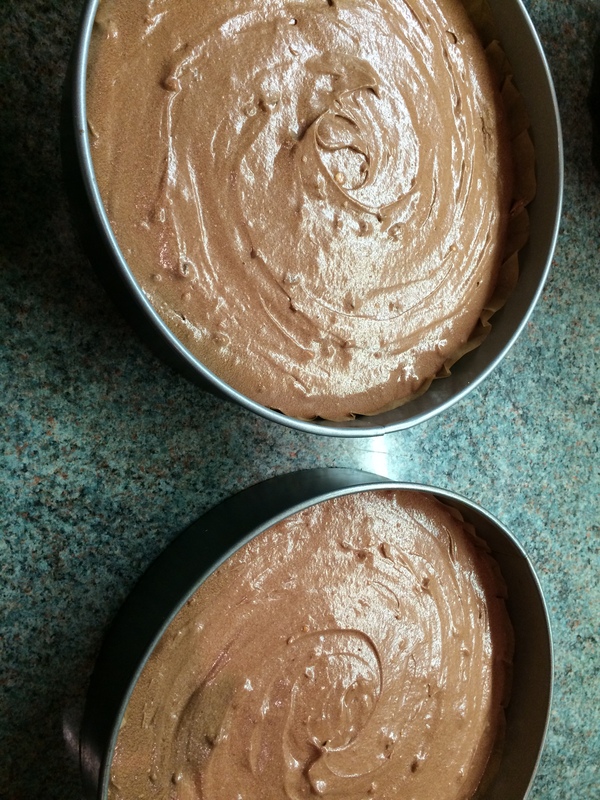 I then spooned a little bit of the batter into the tin and spread it across the bottom evenly. I then placed the tin under the grill and kept a watchful eye over it for a couple of minutes until it was a light brown colour. (As you can see, it went slightly darker than I wanted it to as my high grill setting was just TOO high so I had to turn it down). (At this point, I was knackered and boiling hot from standing in front of the grill 99% of the time and some of my timings started to slip a little – I will say however, that I had enough batter for 20 layers, HURRAH!). After I finished grilling all my layers, I absolutely started to hate this cake but I left it for a little while to cool down before turning it out on to a wire rack. (At this point I was wondering what the heck happened to my 20 layers). Nevertheless, I continued! I melted the apricot jam in a pan and then pushed it through a sieve (I actually think 6tbsp seemed a bit much so I lessened the amount). Using a pastry brush, I brushed the jam all over the top and sides of the cake. 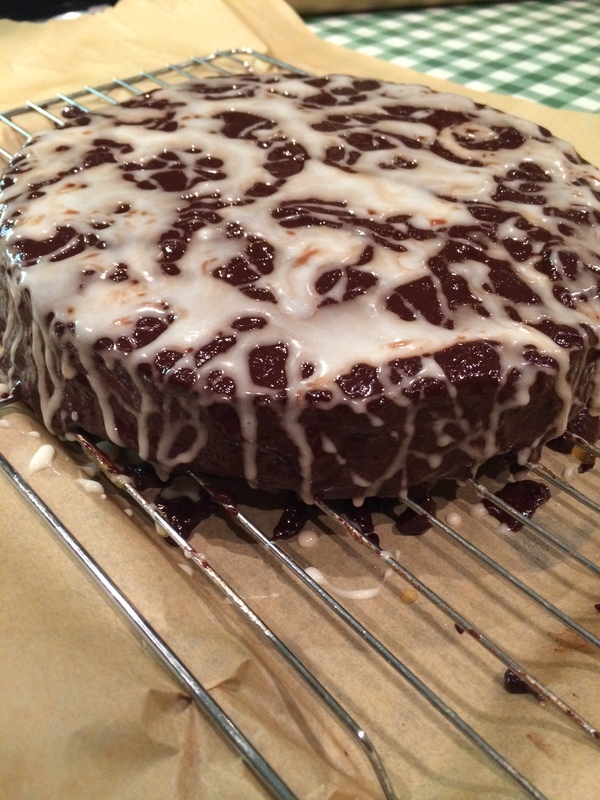 For the chocolate glaze, I began by melting the butter, golden syrup and vanilla extract in a pan (didn’t use any rum of course!). After the mixture incorporated together, I finely chopped the chocolate (I couldn’t find chocolate that was 36% cocoa solids and so went with 70%, but in hindsight, maybe I should have used milk chocolate!) 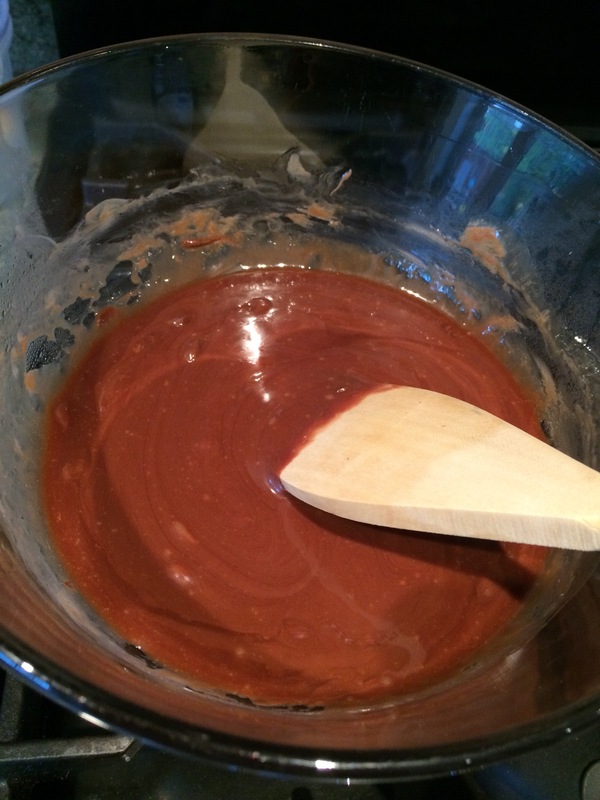 and after the syrup mixture cooled a little I added the chocolate and stirred until it had melted. I then left the glaze to cool to a coating consistency. 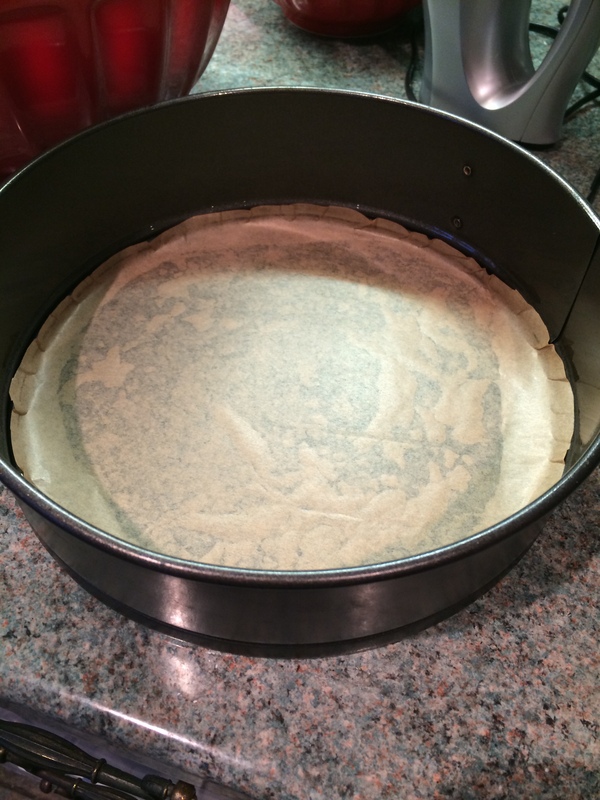 I made sure to place some parchment underneath the wire rack holding the cake before pouring the glaze over the cake. So, all in all I was quite disappointed by the end result, especially when I finally tasted it. IT WAS SO DRY. Oh, I wanted to cry, all that effort! No need to eat your heart out just yet Paul Hollywood! I think next time, I’ll stick to something a little less ambitious! Have you ever tried something as ambitious as this cake and how did it turn out? Let me know in the comments below! 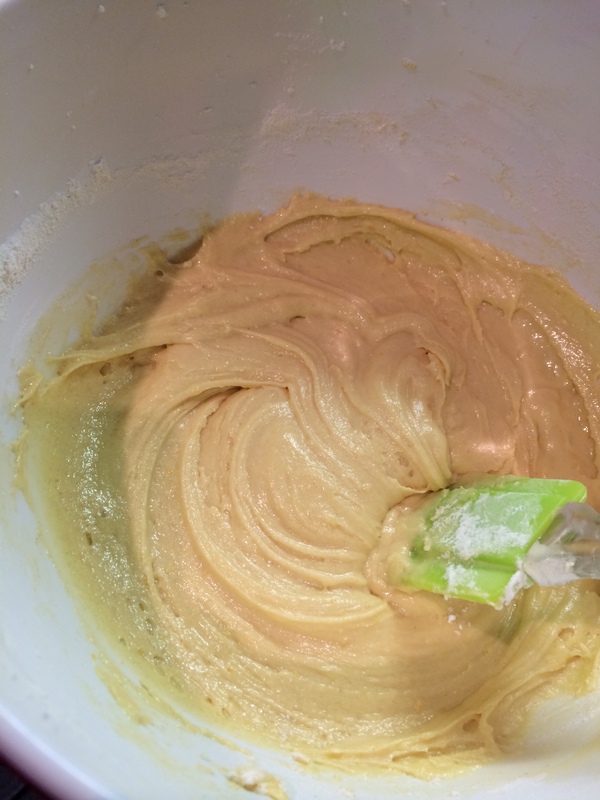 As much as I love trying to bake new things, I still love going back to some old favourites. This particular favourite is something I have made since I was 18, living in a rickety house in the Mumbles in Swansea with my two cousins. 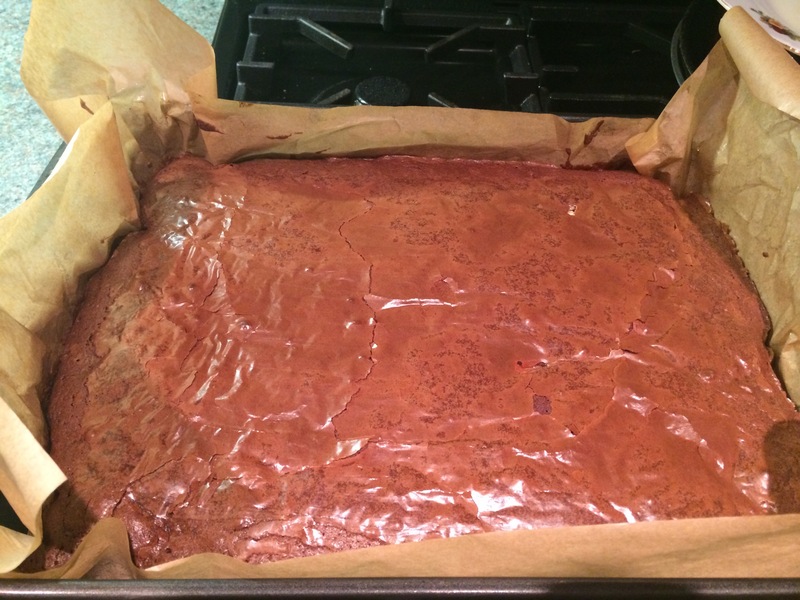 The recipe is based on Antony Worrall Thompson’s Triple Chocolate Brownies found on BBC Good Food Website – Triple Chocolate Brownies. I start by placing a bowl over a pan of water over the heat (make sure the bottom of the bowl doesn’t touch the water. 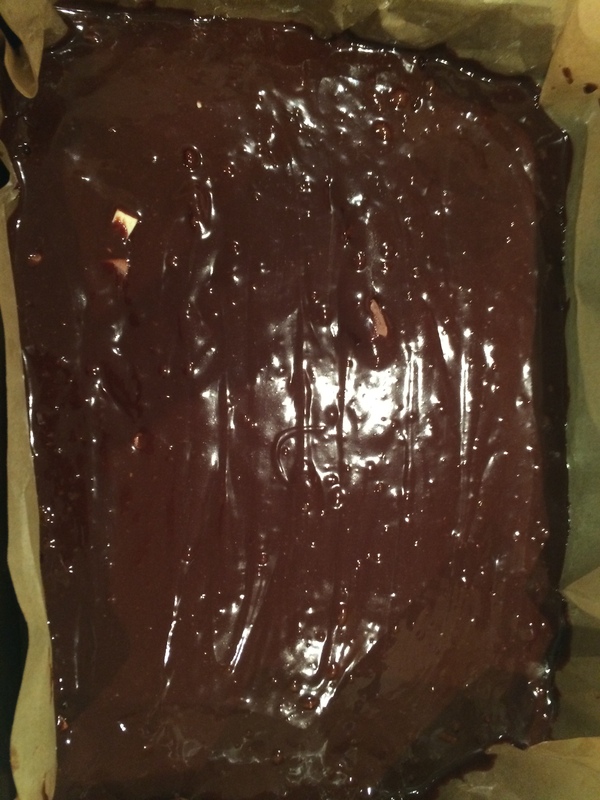 I break up my dark chocolate into pieces (I used 300g of chocolate – why waste any!?) 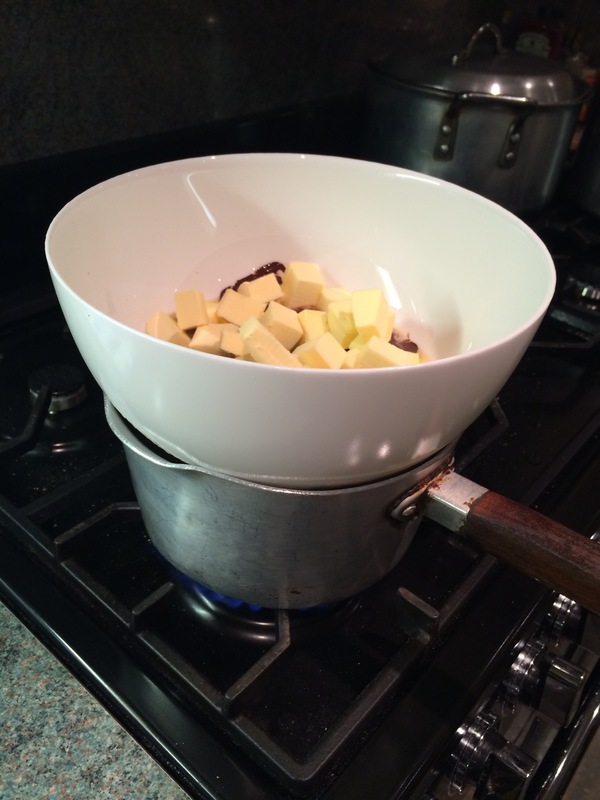 and add to the bowl to melt along with the butter which I chop up into small cubes. 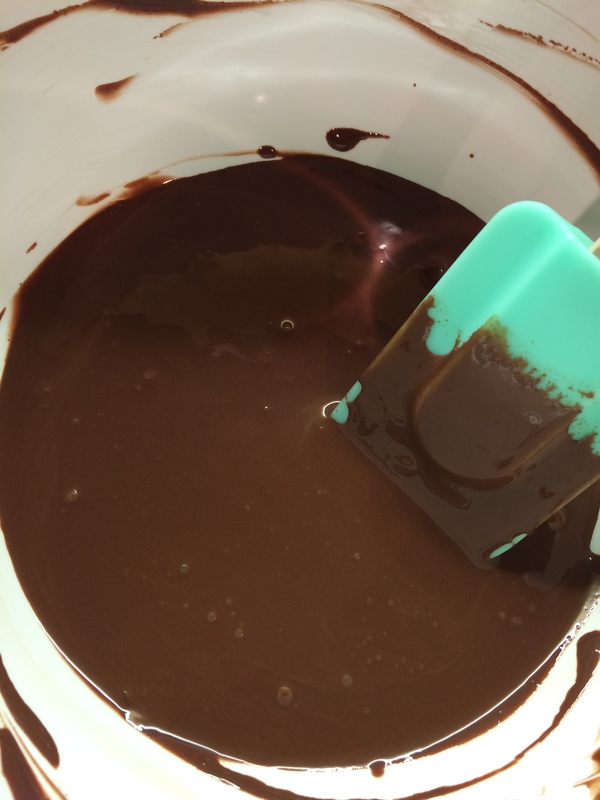 Once the chocolate and butter melted and I had stirred it through to combine, I removed the bowl from the heat (please be wary doing this, the bowl will be hot!) 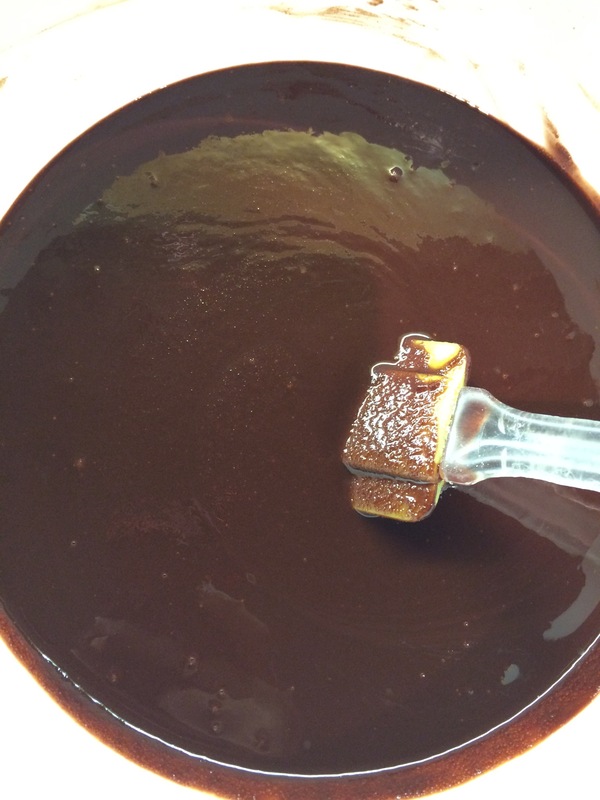 and added the sugar to the chocolate and stirred to combine. 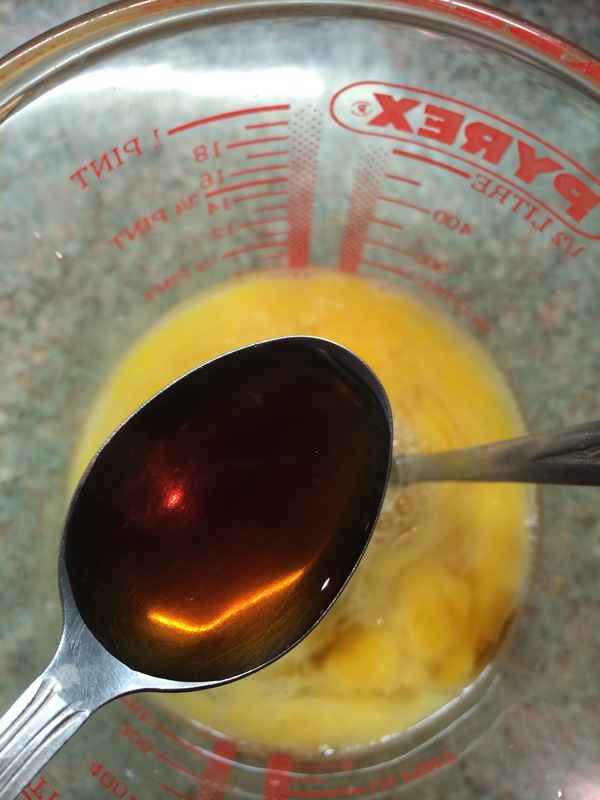 Next I lightly whisked the eggs in a jug and added the vanilla essence to the eggs. 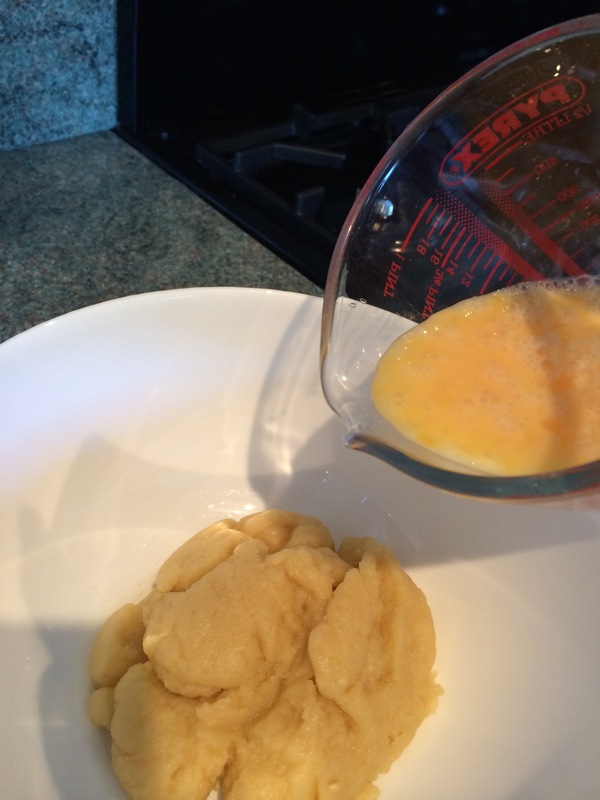 I then added the eggs to the mixture in installments and made sure to mix well after each addition (the mixture might start to separate whilst you’re doing this but don’t panic – it just involves a little elbow grease and continuous mixing!). After this I then lined a tin with greaseproof paper which I lightly greased with some butter and as I have a fan oven I preheated the oven to 150C (the original method says 170C). 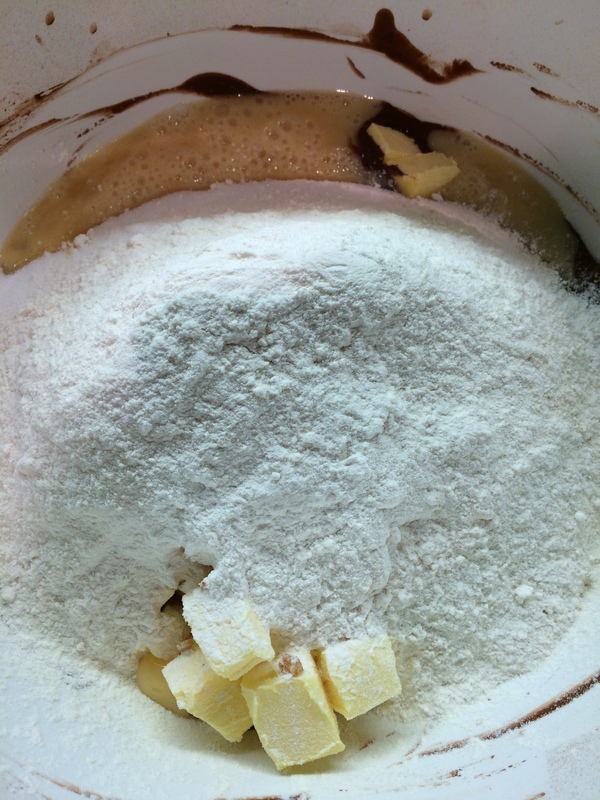 In a separate bowl, sift together the flour and baking powder and then add this to the mixture in installments. 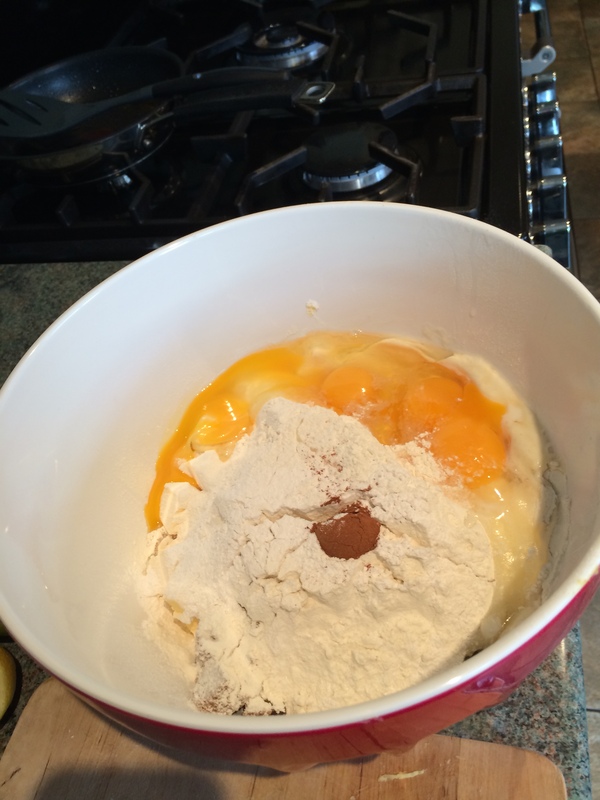 Gently fold the flour into the mixture well after each addition. 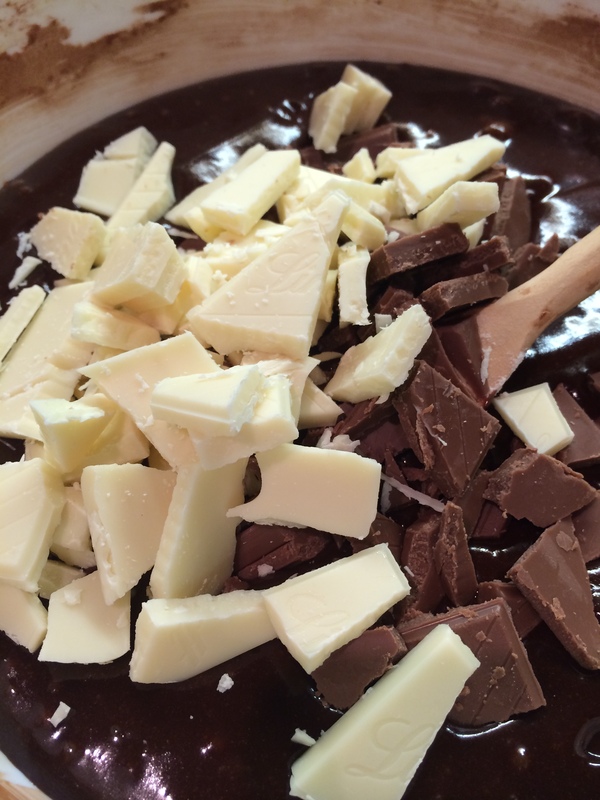 Once all the flour has been folded into the mixture, chop up the white chocolate and milk chocolate roughly into different sized chunks (I used 100g of each – waste not want not!) 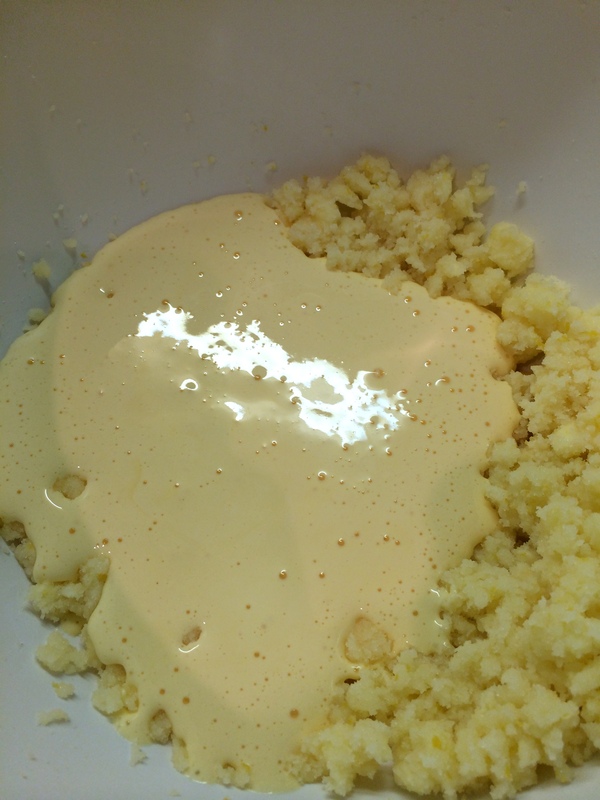 and then add to the mixture and carefully fold them in. You can add nuts such as pecans like the recipe suggests but I tend to leave them out unless it’s requested. With the help of a spatula, I pour my mixture into the greased tin and then using the spatula I attempt to even out the mixture in the tin. I the put the tin in the oven and leave it to bake for about 20 – 25 minutes. You want to slightly undercook the brownies so that when you take it out, the top is firm but the inside should feel soft. 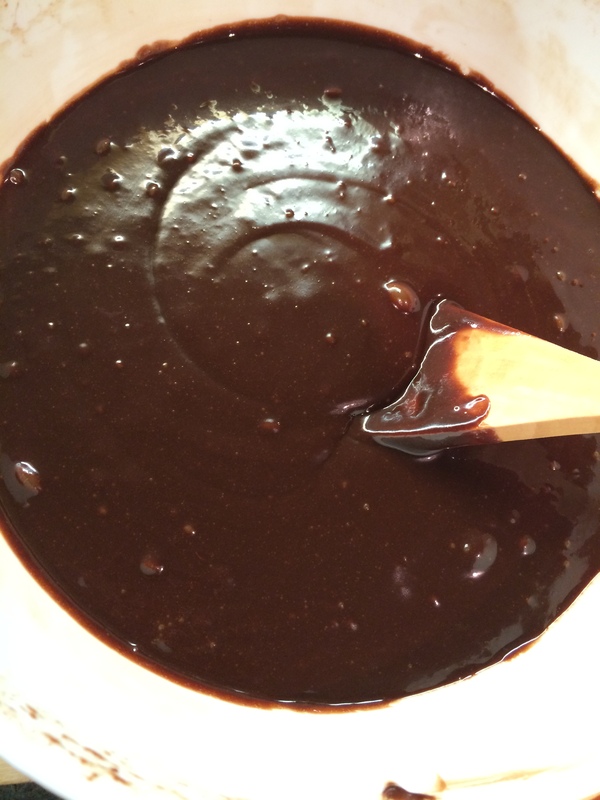 The residual heat from the tin will help gently cook the rest of the brownie without the use of the oven and give you a nice fudgy/gooey brownie. Leave the brownies aside while they cool and be sure not to cut into them straight away otherwise it will definitely fall apart. Serve with a good helping of vanilla ice cream or double cream – YUM. 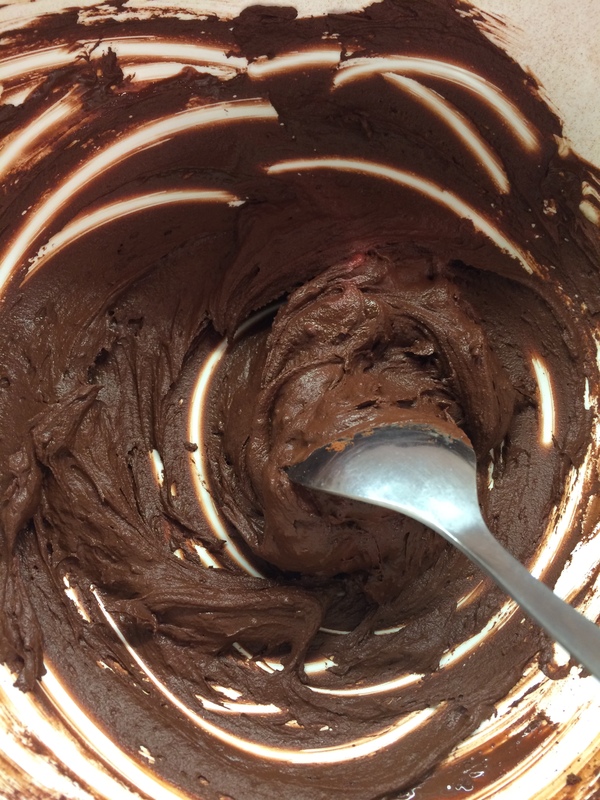 What brownie recipe do you use? Does it have lots of chocolate in it or do you use healthy ingredients like avocado? Do you put in nuts? Let me know! As you can see, there is no photo of me enjoying a midnight brownie as I made these quite late! 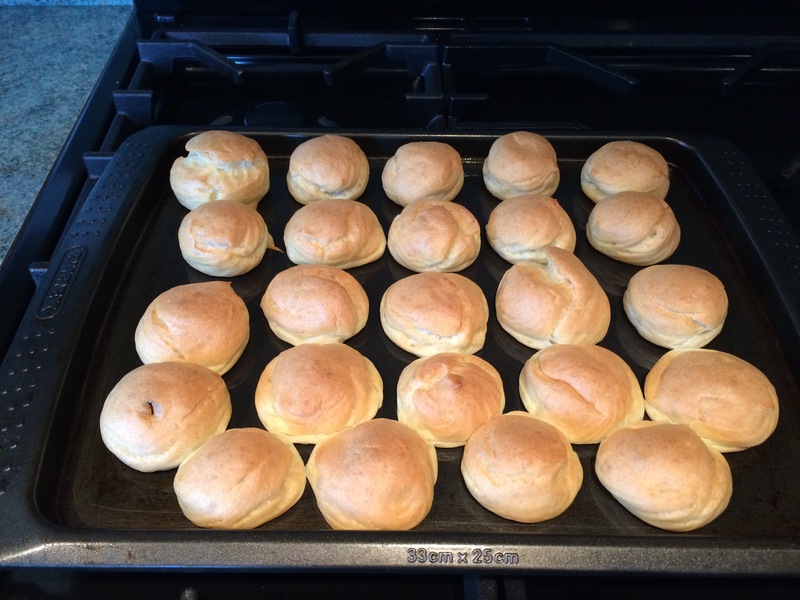 Ok, ok so I sort-of-but-not-really promised a post about making profiteroles almost a week ago now and as you may have noticed – no profiterole post. Oops. 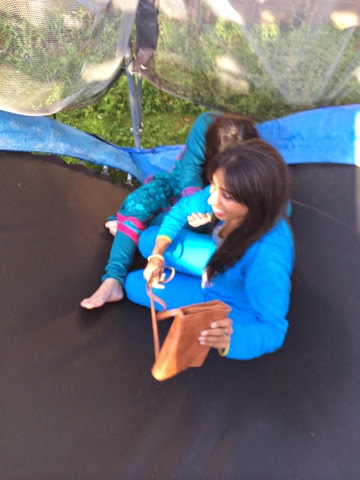 In all fairness, I have been fairly busy this week and have been playing “mum” (my actual mum has gone to Pakistan). 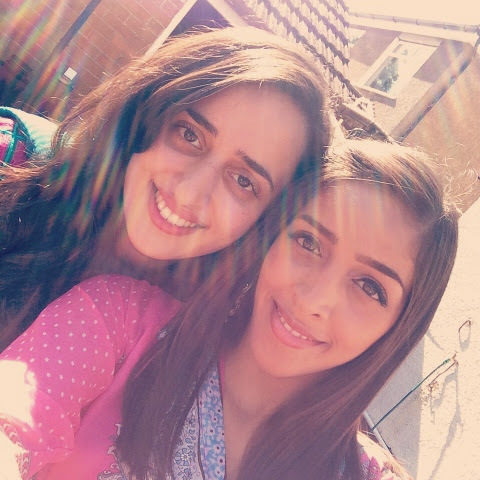 I have been looking after my little sister who had just started school again, and it has been somewhat horrific waking up at 7am to make sure she has everything she needs for the day. Also, I have been helping out with the school run with my dad to help take special needs children to school in the mornings and afternoon. On top of that I have been cleaning the house and cooking so we don’t all starve to death in a dirty house! I told you I was busy! Anyway, back to profiteroles. 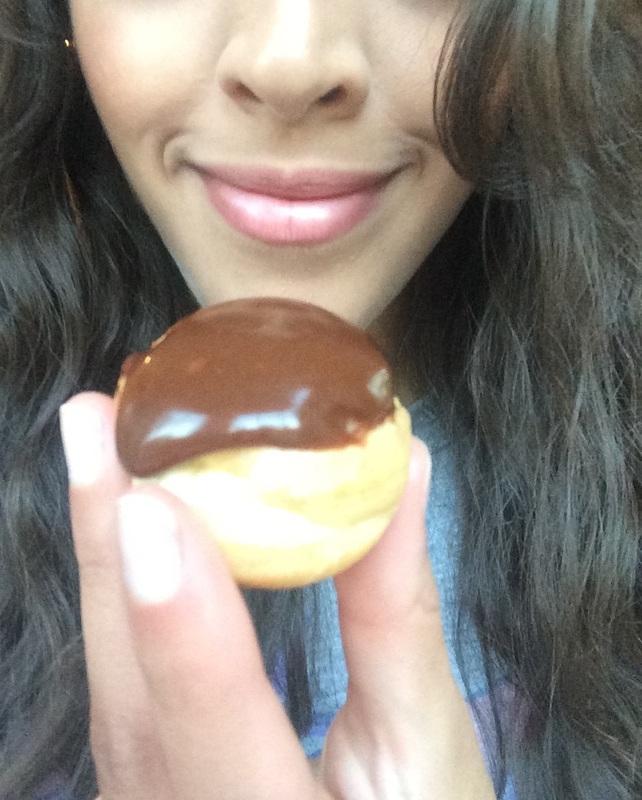 I don’t know about you but I LOVE profiteroles – pastry = good, whipped cream = good, chocolate = GOOD. I could probably eat a whole batch by myself. 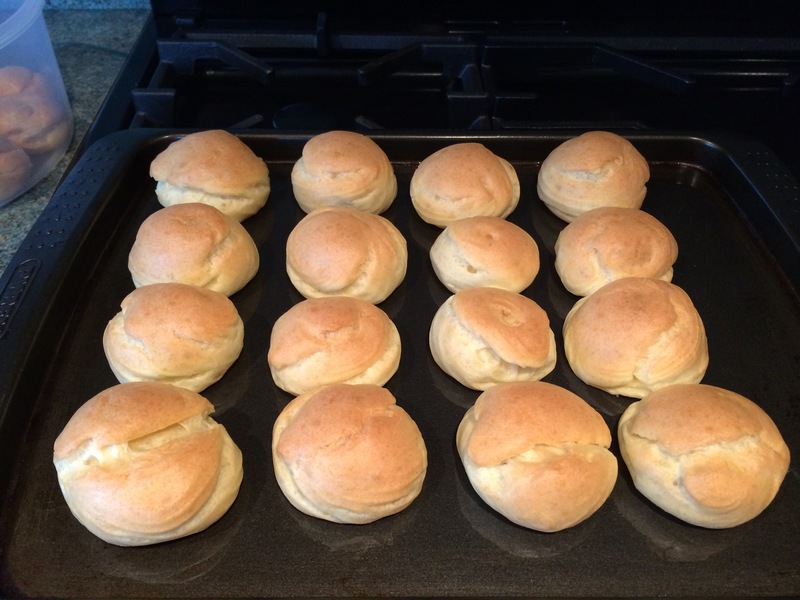 I’m not sure why, but I always thought it might be difficult to make choux buns for some reason (perhaps it’s the fancy French name that put me off) but after I read a couple of different recipes it didn’t sound so hard. I typed “How to make profiteroles” into the search engine and BAM! There they were, recipes galore! I finally settled between two BBC Good Food recipes. The first was a recipe which included a step-by-step video with Lesley Waters and the second is a recipe from James Martin. 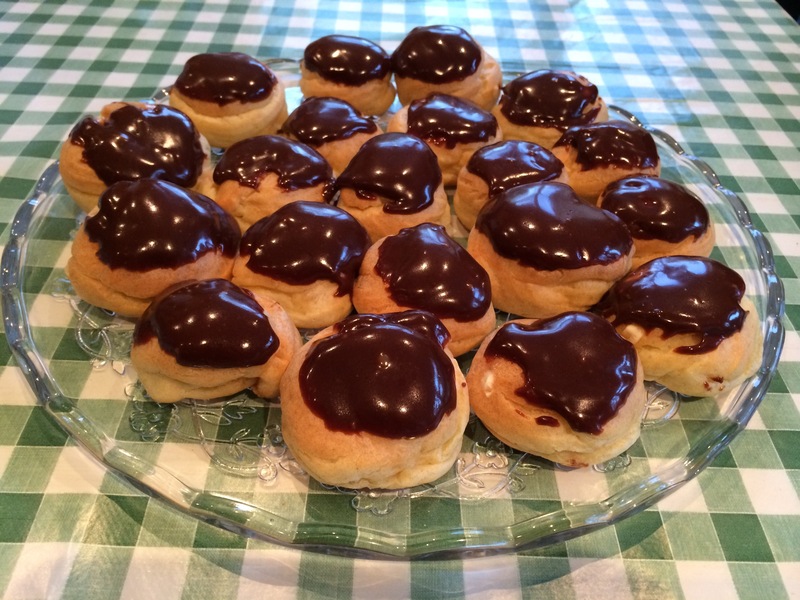 I used the James Martin recipe to make the choux pastry and the Lesley Waters for the chocolate sauce as I thought it sounded nicer. 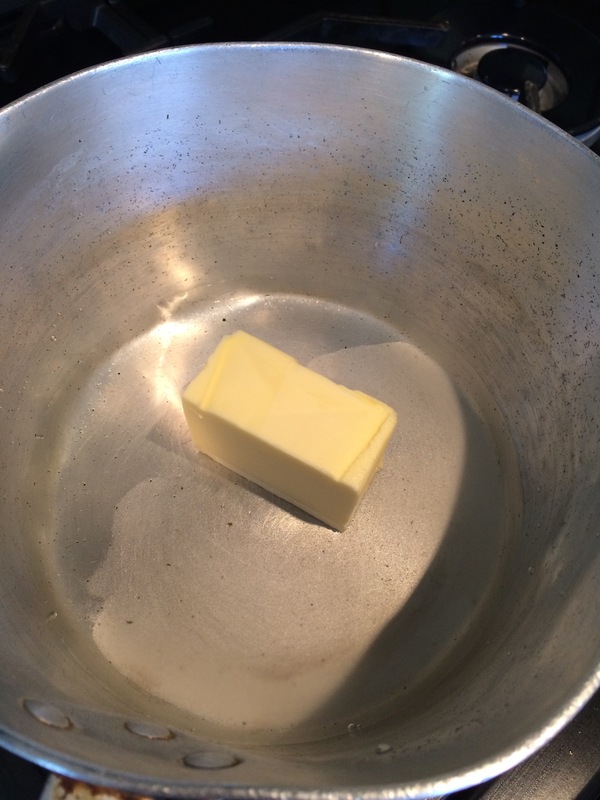 I started by putting the water, sugar and butter into a large saucepan and heated it gently over a low heat until the butter melted. 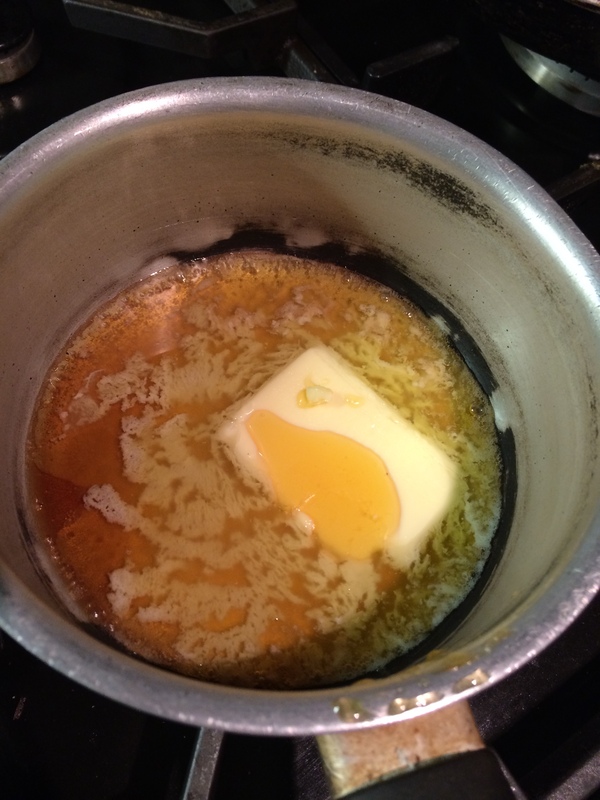 When the butter had melted, I turned up the heat and added the flour and salt straight into the saucepan in one go. 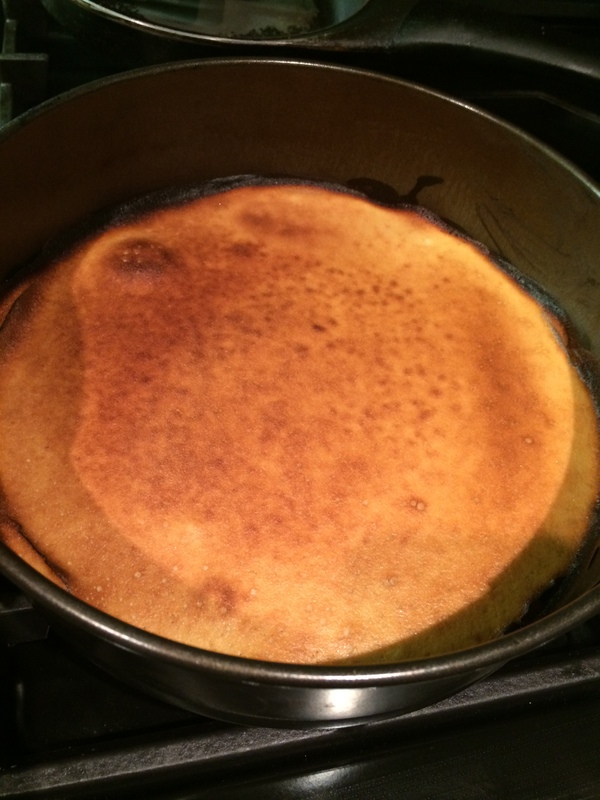 I then removed the pan from the heat and using a wooden spoon I beat the mixture as thoroughly as I could until it became dough-like and came away from the sides. I transferred the mixture to a large bowl and then left it to cool for about 10-15 minutes. When cooking or baking, it’s always good to use a little bit of initiative rather than just following a recipe word for word as sometimes I find I need a little more or a little less of certain ingredients in order to achieve the finished result. For instance, in recipe here, it tells me I need 3 medium eggs (beaten) in order to achieve a “soft dropping consistency” but I found that I needed one more to get it just right. 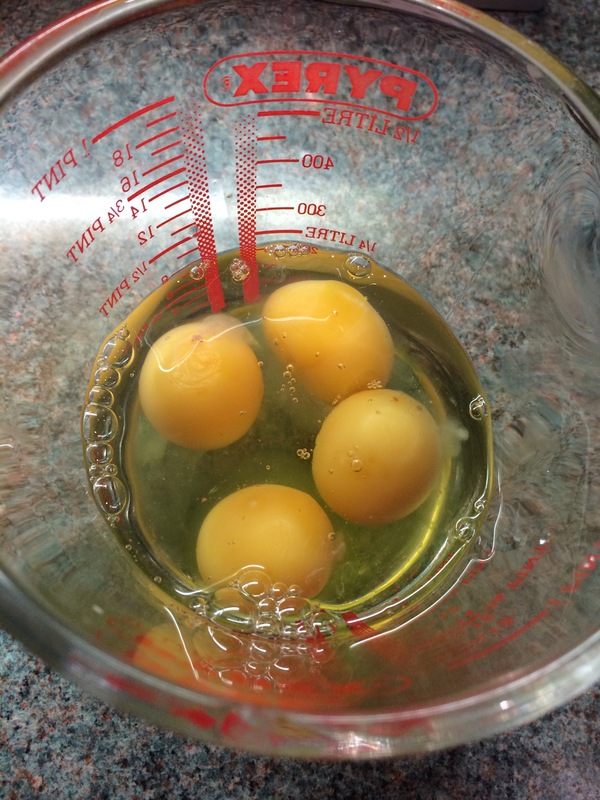 I beat in the eggs a little at a time until the mixture was smooth and glossy and had a soft dropping consistency. At this point I preheated the oven at 180C and placed a small roasting tin at the very bottom. 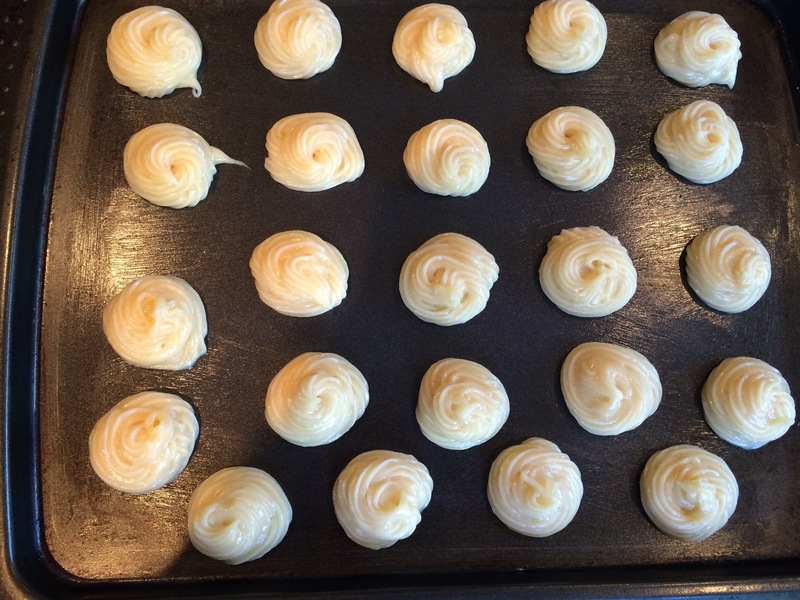 I lightly greased a baking sheet and then filled a piping bag with the choux pastry mixture and then began piping small balls in (very wonky) lines. As you can see, I started off well(ish) but I probably shouldn’t have added the ones at the bottom as it didn’t leave enough space between them – what can I say, I had a bit trigger-happy! 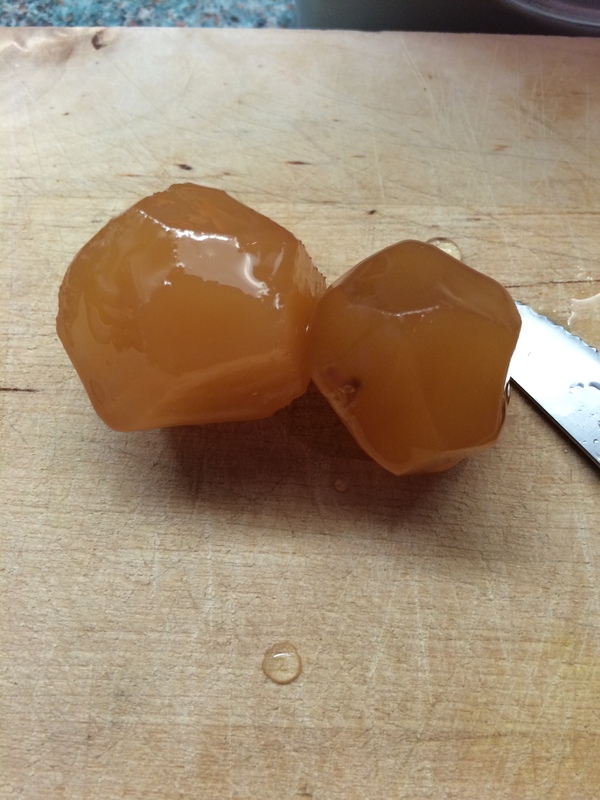 Just before I placed them in the oven, I wet my finger in water and gently rubbed the top of each ball – as according the recipe this meant that the tops would be crisper. I placed the baking sheet into the oven and just before I closed the door, I put in half a mug of water into the roasting tray I placed at the bottom – this helps create the steam needed to make the pastry rise. I then shut the door and baked them for about 30 minutes (or until they were golden brown). In all honesty, I didn’t have any faith my pastry would rise as they started looking quite flat because of the heat, so I left them to it for about 15 minutes and when I got back…they had risen, HURRAH! So my first batch didn’t turn out as greatly I was expecting, as you can some of the ones at the front were a little bit squashed looking, but I still had another batch to go so I wasn’t too worried. I pricked a hole in the base of each profiterole with a skewer and returned them to the oven (which I had turned off for this step) upside down in order to help dry out the inside of the profiterole – I only left them in a couple of minutes here. At least the second batch turned out better! I put aside all the profiteroles to cool down while I made the cream filling. Instead of following any of the recipes, I just did some guess and taste work. I actually thought I had two pots of double cream but it turned out I only had the one and didn’t have time to go and get a second one, but nevertheless I cracked on. 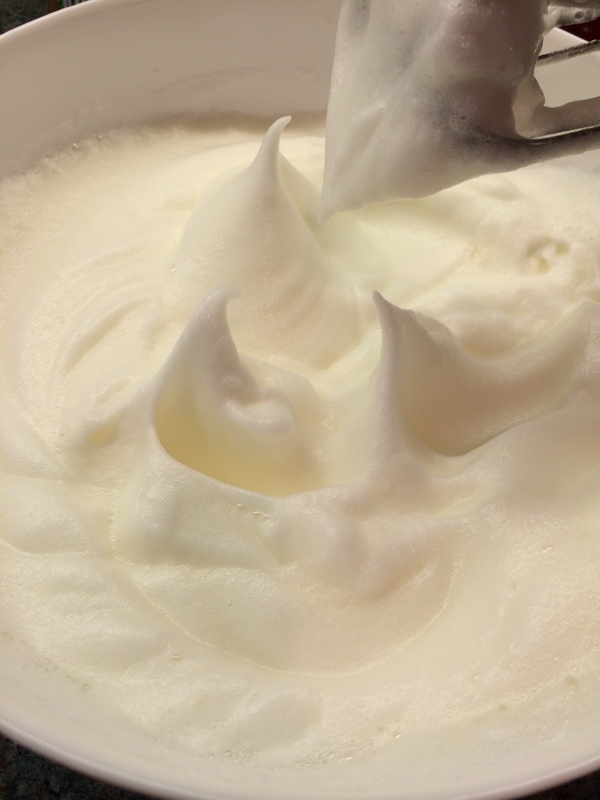 I poured the double cream into a bowl and using my electric hand-held whisk I beat the cream until it formed soft peaks. Then using a metal spoon I folded in a little icing sugar (I didn’t really use measurements, I just sifted some in). I didn’t want the cream to be too sweet because of the chocolate I would be adding later on. 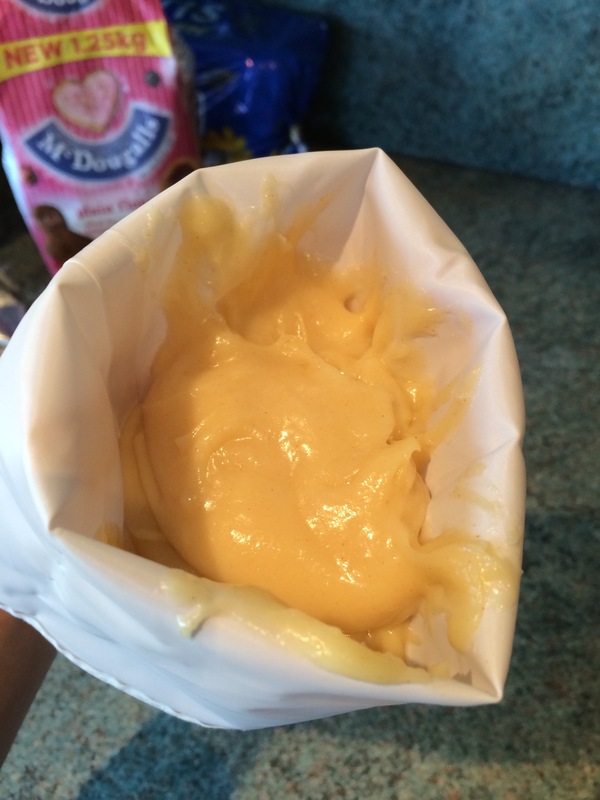 Once the profiteroles had cooled down, I spooned the cream into a piping bag (fitted with a small nozzle) and began filling the profiteroles. In hindsight, I should have filled them from the sides but dopey me filled them from the bottom instead! For the sauce, I placed a pan of water over the heat and placed a bowl over the top (make sure the water doesn’t touch the bottom of the bowl) and I added 100g of milk chocolate broken into pieces (I couldn’t find where the dark chocolate was stashed so again I improvised!). 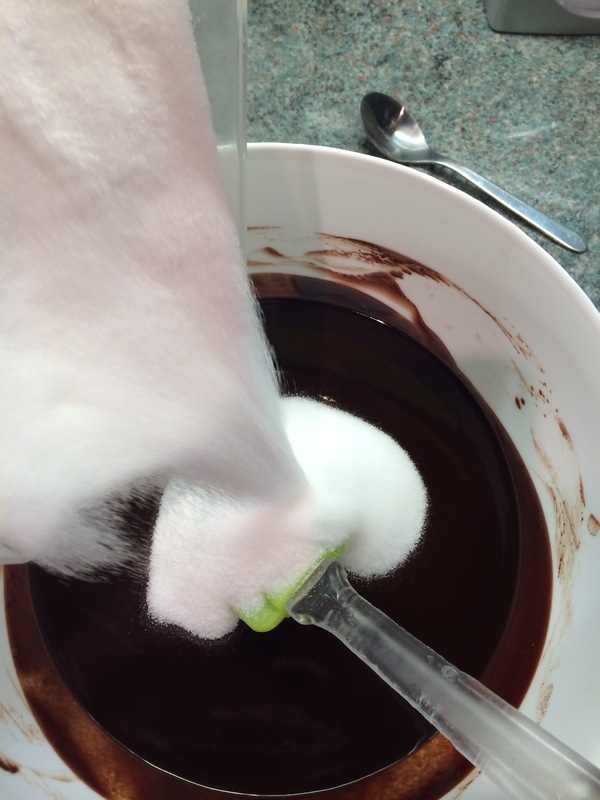 I then added three tablespoons of golden syrup to the melted chocolate and began mixing until everything was incorporated. 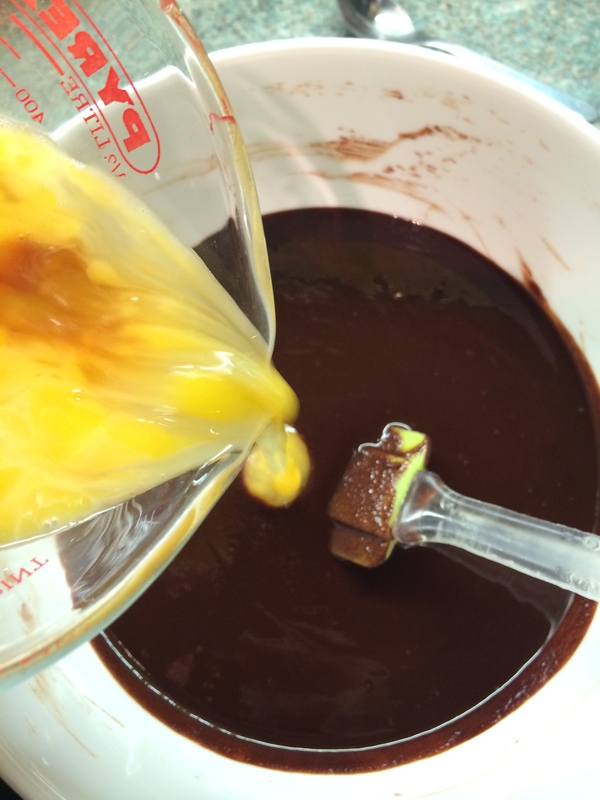 As you can see from the recipe, it mentions adding the juice from half an orange, but I skipped this step – I wanted my chocolate sauce to taste chocolately and not orangey. Instead of pouring the chocolate over a tower of profiteroles, I dipped the top of each one into the sauce so that each profiterole got an even helping. And here is the finished result – not bad for a first try, eh? And as it is customary, I got the first try! 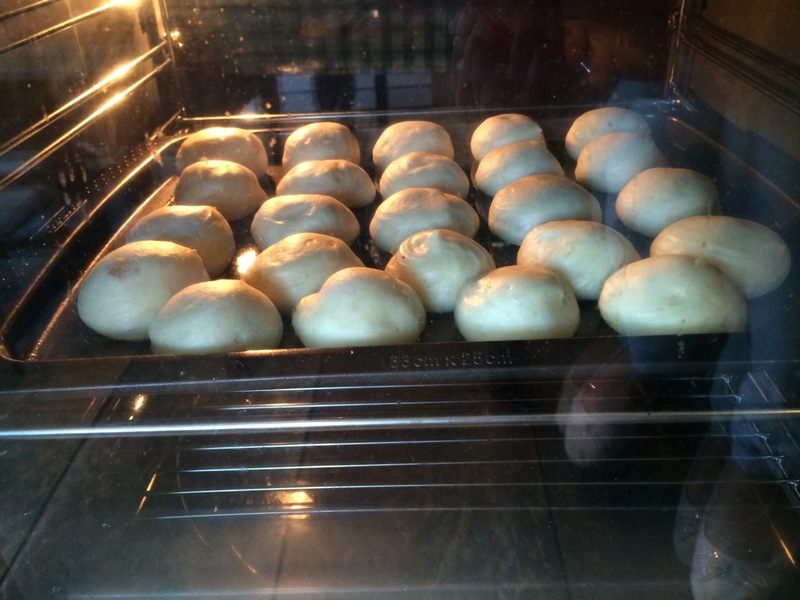 Have you ever tried to make profiteroles? If so I would love to know how yours turned out in the comments below and whether you tried anything differently or used different flavours. 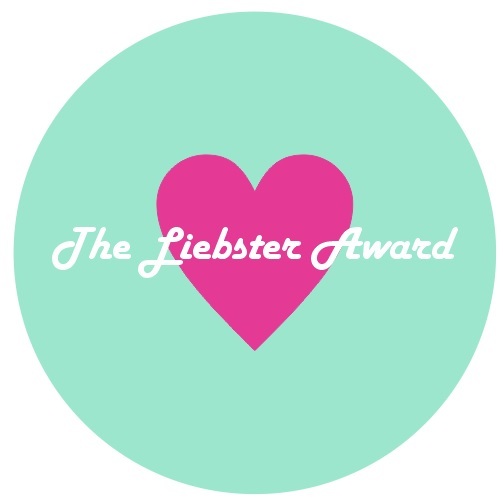 A few days ago, fellow Swansea University Alumnus and blogger – the lovely CaraDare nominated me for something called the Liebster Award. In all honesty I had to research what it was because I didn’t know, but it turns out its a wonderful little way of opening up the blogosphere and finding out a little more about new and exciting blogs you never knew about and the people who write them. According to Google Translate, the German word ‘Liebster’ means ‘darling’ – cute isn’t it? However from further googling the word is also used to describe things that are pleasant, endearing, lovely, sweet… you get the idea. Thank you CaraDare for my nomination! As it is the first day of a new month, I thought now would be a good time to share my answers and my nominations for the Liebster Award! 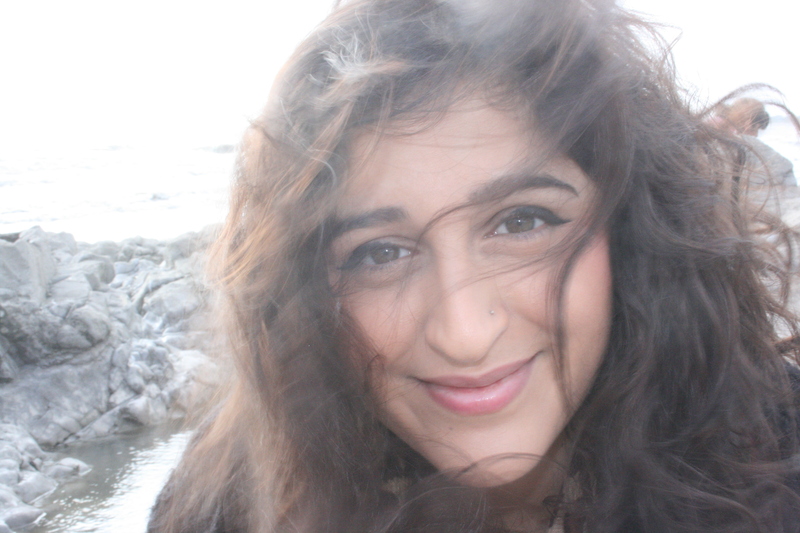 Back in December 2010, myself and Elena Cresci started a little unassuming new media blog called The Siren as a way to shake things on how things at Swansea University got reported. We wanted to cut away from your typical newspaper and create something fresh and innovative and give other students a chance to write and say what was on their minds. Needless to say The Siren took off in a way we never imagined and before we knew it, we were recognised as a true Student Media outlet and we were winning awards! At the time I was studying my Masters in Creative Writing and found it great to write so freely. I then decided to start up my personal blog as part of a portfolio of sorts as well as wanting to create a personal presence on the internet. Off-duty with a geek-chic twist – I am definitely more at home in a pair of worn out Converse than I am in towering heels! 3. What are your favourite and least favourite things about blogging? Favourite: I love having the freedom to write about whatever I feel most passionate about and being able to share that with other like-minded individuals. Least Favourite: Sometimes my life is a bit hectic and so it can be a struggle to find the time, peace and quiet in order to sit down and write about something. 4. What is your go-to source for inspiration? My experiences give me a great source for inspiration, as it does for most writers – write about what you know! I’m a huge geek – talk to me about comic books and I will probably talk your ear off. 6. What are your top places to shop? New Look – SHOES. That is all. Next – I adore the childrens section in here; I have a lot of nieces and nephews and I can always find something in here. 7. What is your most memorable travel destination and why? It has to be my Sixth Form Media Studies trip to Hollywood. 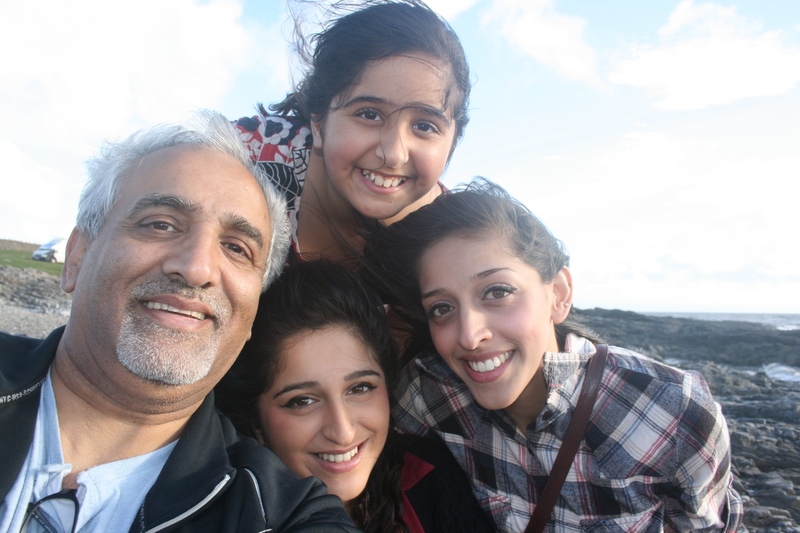 It was my second time going to America and I loved every minute of it. We stayed just off the Walk of Fame in a great little place called USA Hostels Hollywood. Every morning there was a HUGE vat of pancake batter mix and gallons of maple syrup, sugar, lemon juice all ready for everyone to make stacks of pancakes for an all you can eat bonanza. The stand outs of the trip was watching Sacha Baron Cohen attend the premiere for his film Borat (he was in a donkey drawn limousine) and attending the premiere showing of ‘Tenacious D in the Pick of Destiny’ and of course SHOPPING! 8. Where’s next on your travel wish-list? There are so many places around the world I would love to travel to, but at the moment I’m quite enjoying discovering the hidden gems the UK has to offer. 9. What are your absolute beauty must-haves? Concealer, concealer, concealer. I have terrible dark circles so it’s something I definitely need. At the moment I am loving the Collection 2000 Lasting Perfection Concealer which lasts me all day. 10. Who are your style muses? I don’t have any particular style muses, but I will often trawl through Pinterest to look for inspiration. 11. What’s on your wish-list for this upcoming autumn/winter? I definitely want to invest in some classic Hunter wellingtons as well as some knee-high boots to wear with dark muted floral dresses and skirts and chunky knits. Oh how I long to live in chunky knits forever! 1. My full name is Samaiyyah Naz Siddique but people just call me Sam or Sammy. 2. Even though I claim to love fashion, I actually sort of hate shopping! 3. 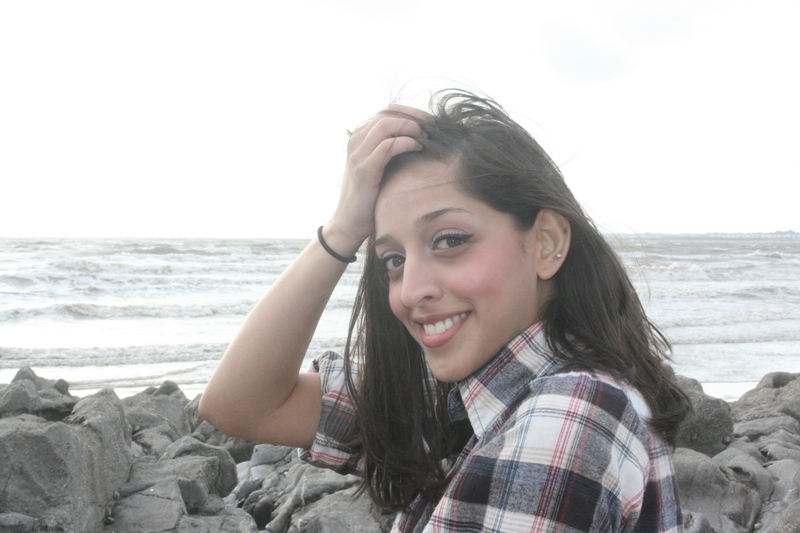 I have two degrees – a BA in English with Creative Writing and an MA in Creative writing. 4. Being Asian, I have an insanely large (and sometimes loud) family that spans across the world. 5. One wish of mine would be to visit New York or Paris during the December month as I am a sucker for twinkling fairy lights. 6. My all-time favourite book would be Douglas Adams’ Hitchhiker’s Guide to the Galaxy. 7. Dragonball Z was my favourite anime when I was younger. 8. I collect comic books and graphic novels. 9. When I was three, I almost fell into a pond after trying to chase a duck. 11. 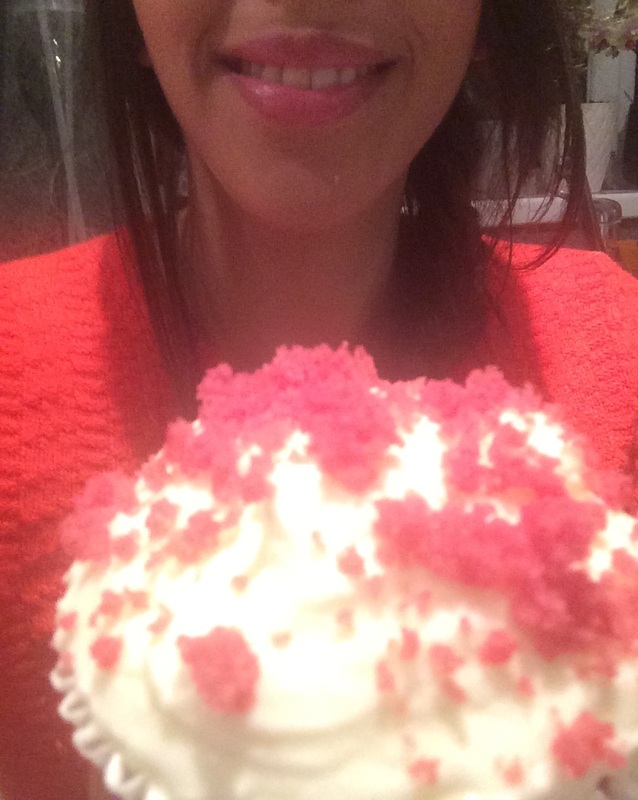 And as you may have guessed, I LOVE to bake! Nothing Rhymes With Rachel – This girl has a serious makeup addiction and I love seeing the different looks she comes up with. Pink Peonies – A South African beauty blogger that I have been loving lately and she’s also started up a YouTube channel as well. The Girl in the Little Black Dress – Poetry, France, Fashion… J’adore! Cooking with a Wallflower – There are so many amazing recipes I want to try, who knew I could do so many things with breakfast! Blu Chicken Ninja – A great blog about all the things I love including books, nerdy things and cats. 1. You have to answer the eleven questions created by the person who tagged you. 2. You have to also list eleven facts about yourself. 3. Pick between 5-11 bloggers to nominate. They need to have under 200 followers. 4. You can’t nominate the person who tagged you. 2. What would your last meal be and why? 3. Tell me a fun fact about yourself. 5. 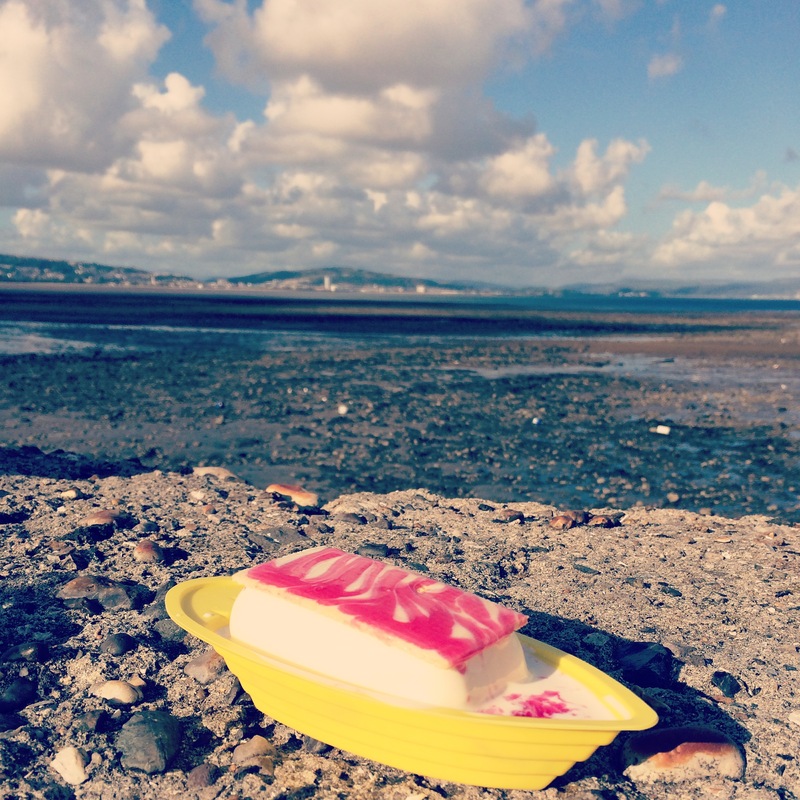 If you were stranded on a desert island, what five items would have with you and why? 6. Describe yourself in three words. 7. What is your biggest pet peeve/annoyance? 8. If you could travel anywhere in the world or beyond, where would that be? 11. What are your favourite and least favourite things about blogging? If I haven’t tagged you then don’t worry! You can always leave you comments below if you’d like to answer the questions as well, the more the merrier! And if you’ve enjoyed reading my blog so far, then don’t forget to follow! Before I begin, I did some research into copyright laws about me posting recipes/methods from cookbooks (I don’t really fancy getting into trouble!) 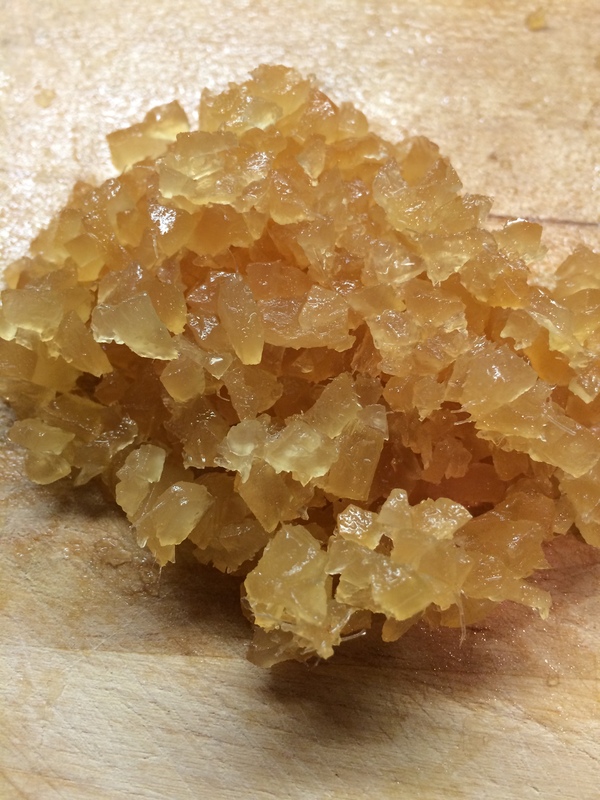 – from what I have read and have understood on a common sense basis, it’s ok for me to write about the recipe/method as long as I don’t copy the cookbook word for word. Additionally, I will always make a mention of where the original recipe came from (with links if I can find them) as I have done so below. Red Velvet is one of those classic cake recipes that I’ve always wanted to try making. 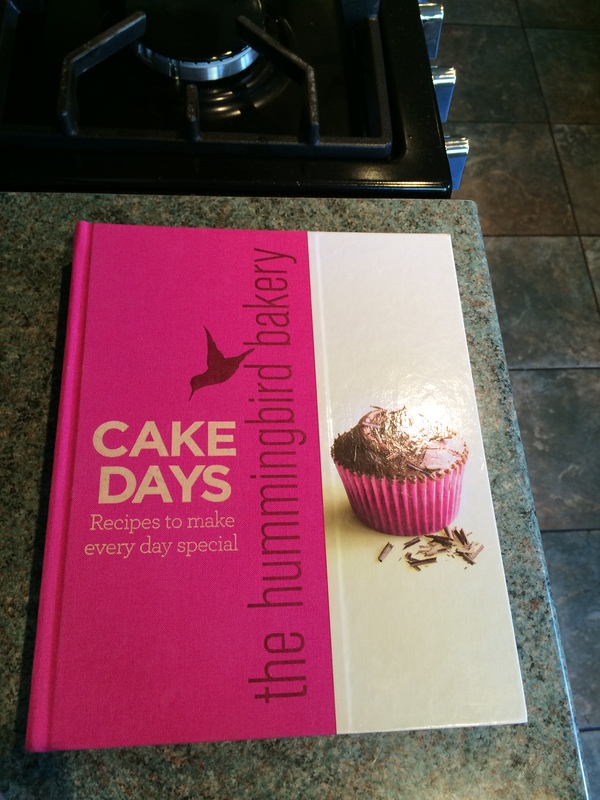 The recipe I used was from The Hummingbird Bakery‘s Cake Days cookbook. What I like about this cookbook is that the quantities are for muffin-sized cakes rather than cupcakes (which are smaller) – so essentially these recipes allowed me to make bigger cakes, which is always a good thing! This is actually my second attempt at making Red Velvet; the first time I made a cake and it didn’t go as planned. 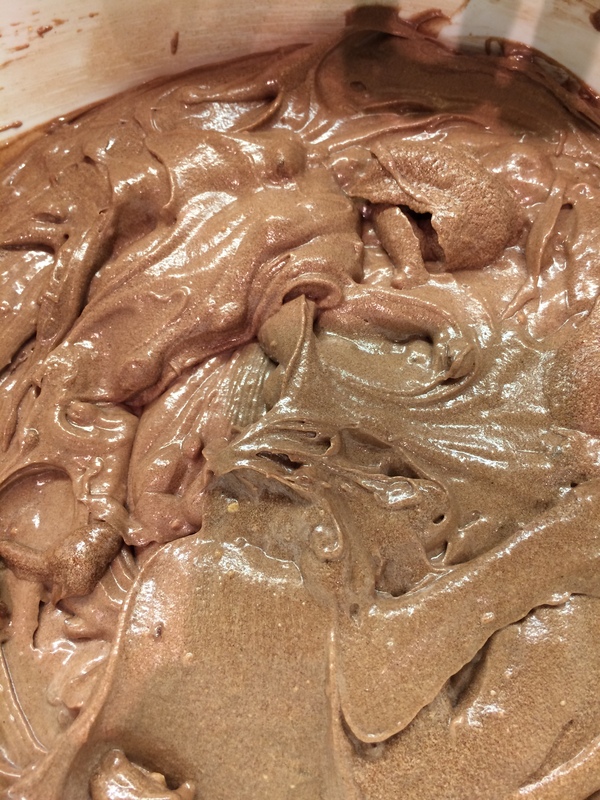 After using 40ml of red food colouring (which is more or a less a whole bottle) into my cake batter, after adding the cocoa powder, I found that it totally ruined the brilliant red colour I managed to achieve in my batter and it turned it…well, brown! So that really disappointed me. 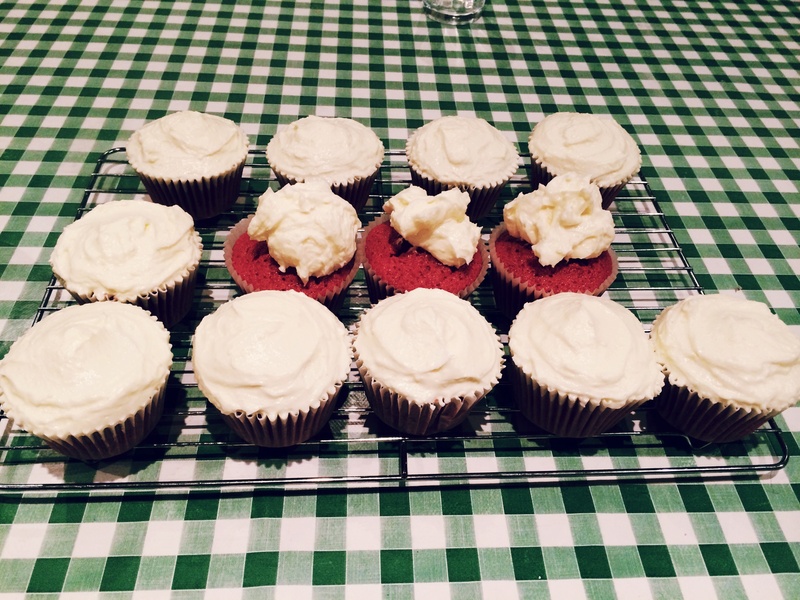 This time, I stuck to making cupcakes. I made a few changes here and there as I went along due to how the first attempt turned out, but also because I am one of those people who will taste as they cook – if something doesn’t taste, smell or look right to me (regardless of what a recipe/method tells me) then I will use my initiative and change it up a little. I won’t be mentioning any specific brand of ingredient as it will feel like I’m favouring; I just used whatever I had in the house! 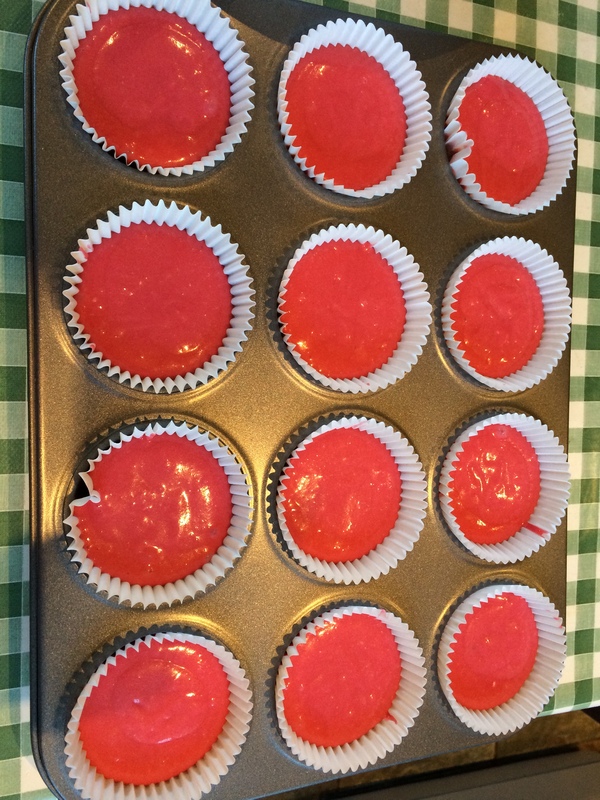 On another note, there must be some kind of nation-wide shortage on red food colouring these days as I must have gone to five different shops and they had diddly-squat! Eventually I did end up finding some food colour gel which was labelled ‘bright red’ – it was the only choice I had so I went for it! Often, most recipes require you to preheat the oven right at the beginning but I waited until a little later to do that as we recently got a new cooker and as the ovens are fan-assisted they work quite quickly. I like to start off by weighing out all my ingredients so I have them ready and I also lined a muffin tin with muffin cases. 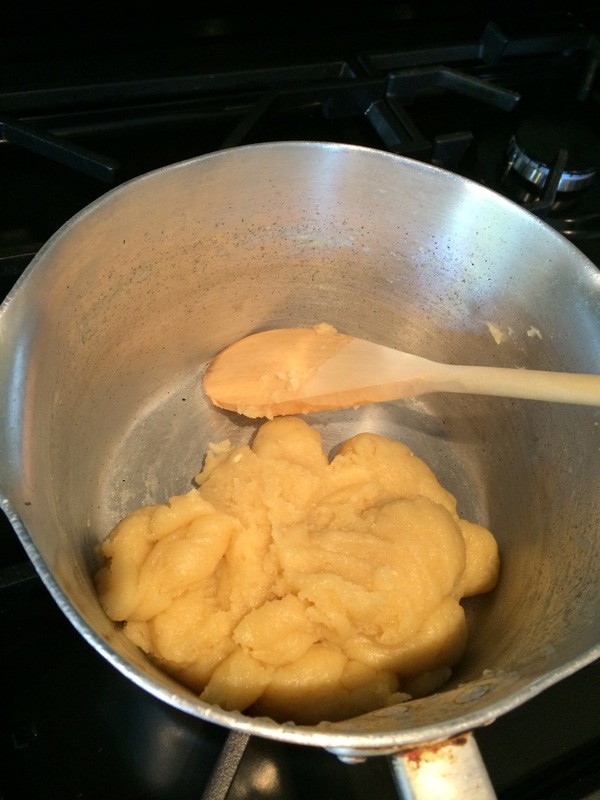 With a hand-held electric whisk I creamed the butter and sugar together until pale and fluffy. I cut the butter into small cubes to help the process along a little quicker. I then added one egg at a time and mixed it thoroughly, making sure to scrape down the sides of the bowl after each addition. 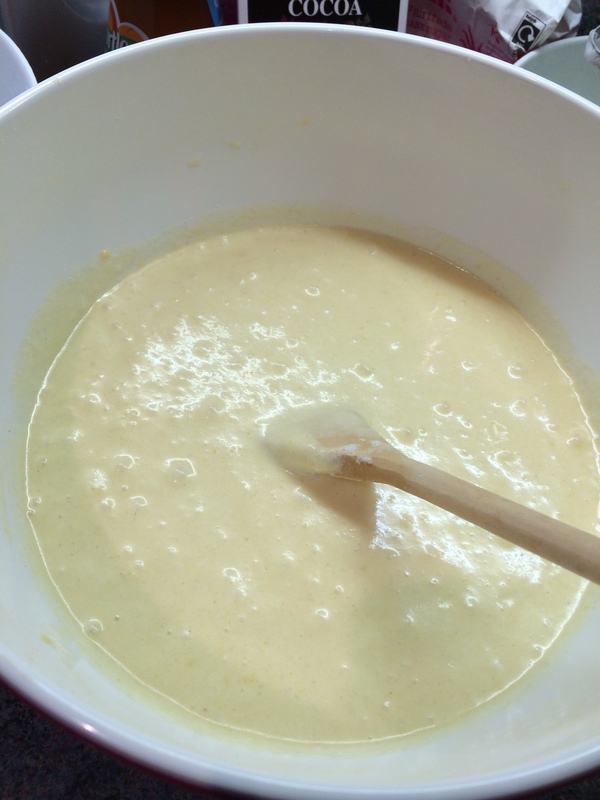 I added 1tsp of vanilla essence to the cake batter and mixed it in well. 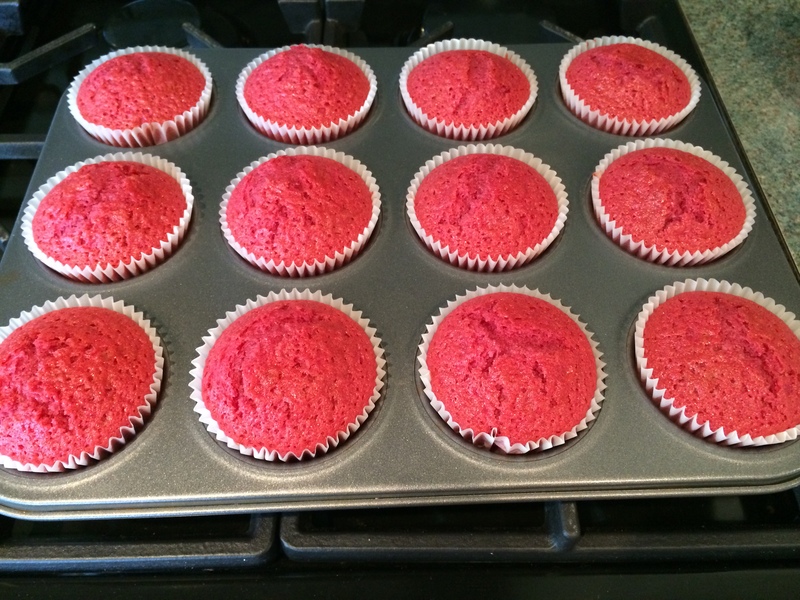 I added the red food colour straight into the batter and kept mixing until I achieved the right colour – however I was a little disappointed with the result, I think it turned the cake batter more pink than red. 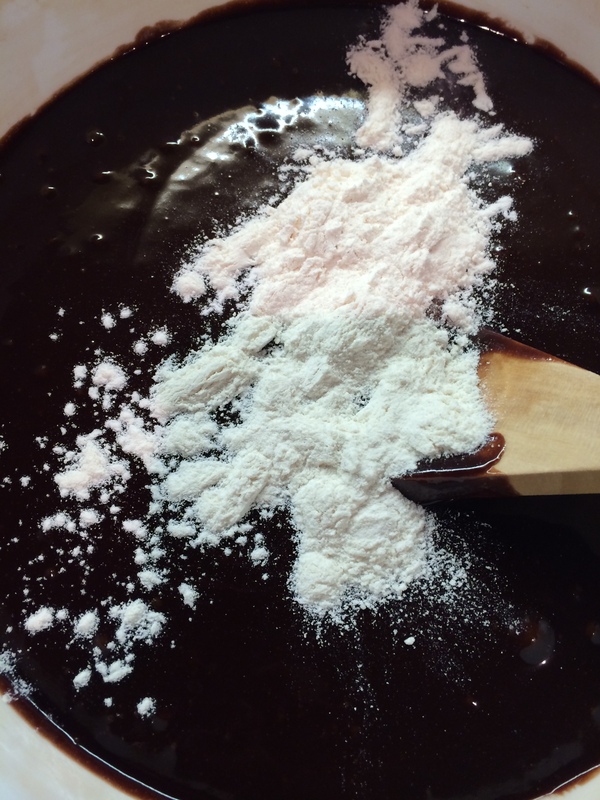 Here is where I added a very small pinch of cocoa powder to the cake batter to help deepen the red colour. 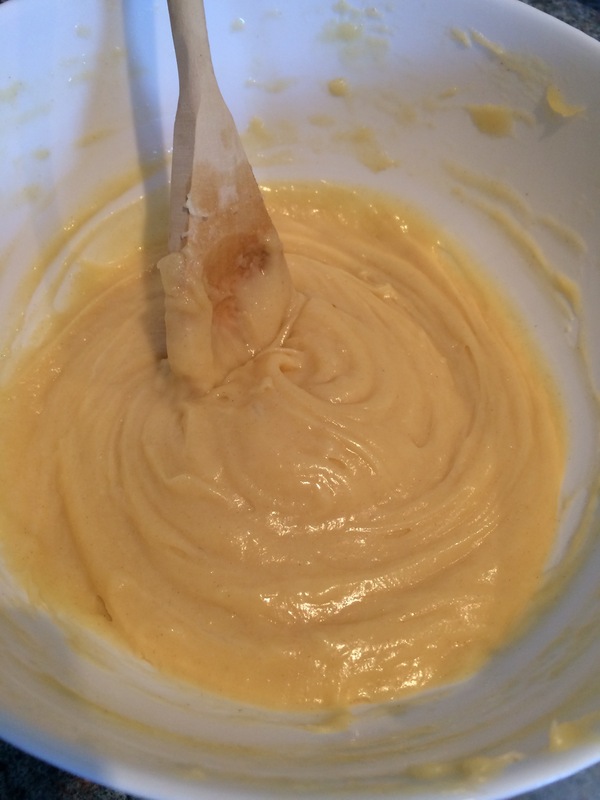 I sifted the flour and salt into a separate bowl; I then added half of the flour/salt to the cake batter and folded it in with a spatula (I was too scared to use the electric whisk for fear of covering the kitchen in flour). 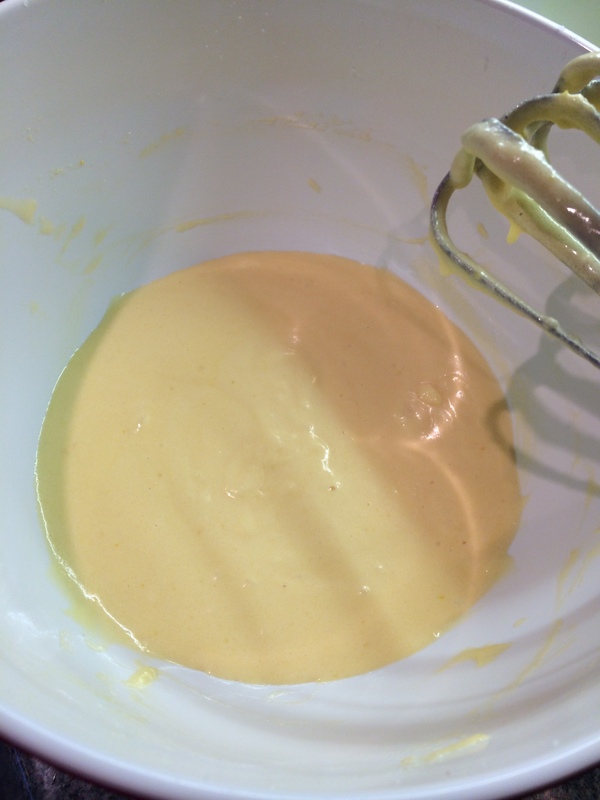 I poured in half of the buttermilk to the cake batter and mixed it well. 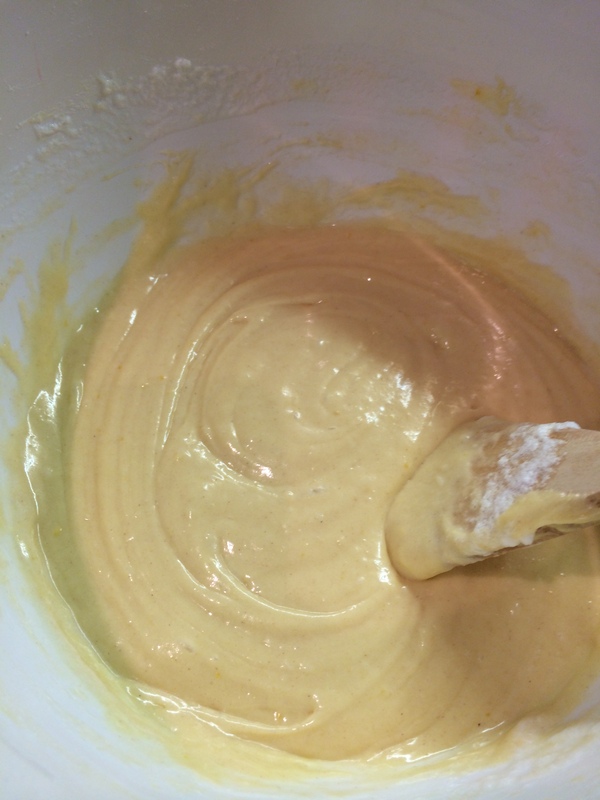 I added the other half of the flour/salt mix to the cake batter and made sure to fold it in well. Finally I added the rest of the buttermilk to the mixture and mixed that in (the buttermilk I bought was 250ml, which I used it all rather than leave a measly 10ml behind). As I don’t imbibe in alcohol I am always looking for ways to substitute alcohol ingredients for non-alcoholic ones and sometimes it proves a little difficult. This recipe calls for white wine vinegar (of which I didn’t have) and I spent hours trawling the web for a suitable substitute and in the end I settled for using white vinegar instead. Finally, in another bowl I mixed together the vinegar and bicarbonate of soda but I also added about 1/2tsp of sugar to the mixture to combat the very sour taste a little. 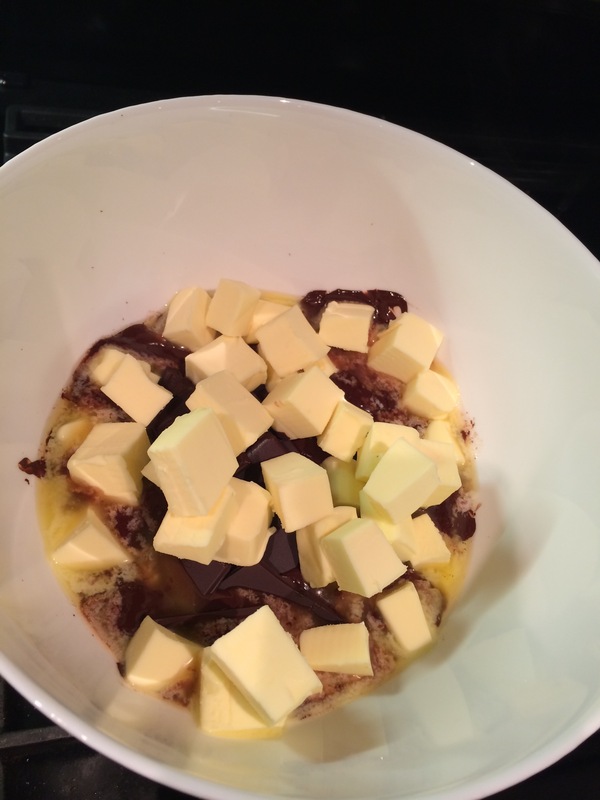 I then added this mixture to the cake batter and made sure to incorporate it all. Because I have a fan-assisted oven, I actually lowered the temperature to 170 degrees celsius rather than 190 degrees celsius. While the oven preheated, I spooned the cake batter into the muffin cases in the muffin tray using two spoons (or you could use an ice-cream scoop) until they were two-thirds full. I then popped them into the oven and after 20 minutes they were done. 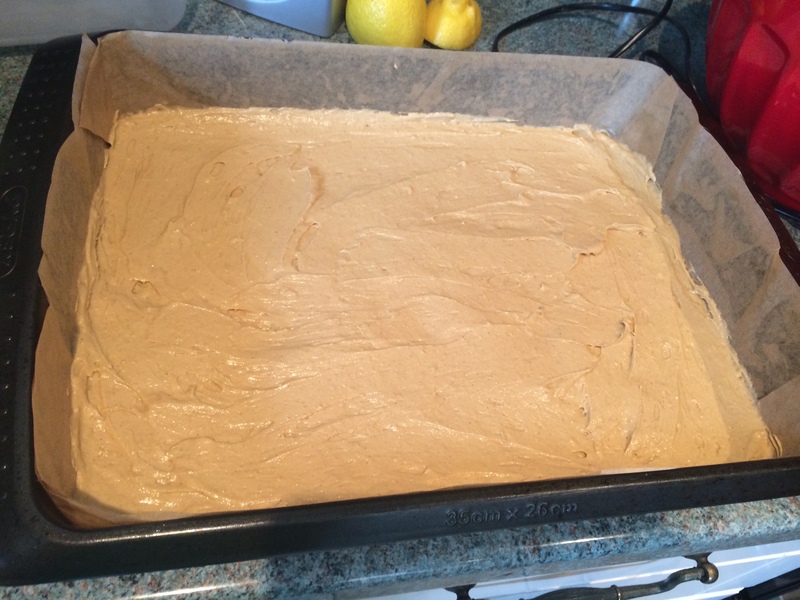 After letting them cool in the tin I transferred the cakes onto a wire rack to cool while I made the frosting. Using the electric whisk I beat together the butter with only 200g of the icing sugar as I didn’t want my frosting too sweet (this is an American style recipe after all) until the mixture was sandy. 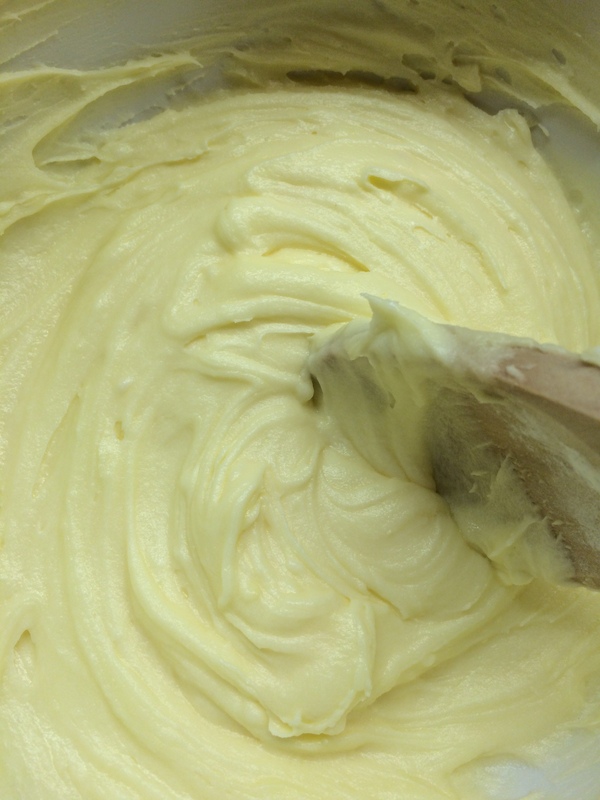 I then added the cream cheese and mixed it slowly until it was incorporated into the mixture well enough before I increased the speed on the whisk and beat the frosting until it became soft and fluffy. Once the cupcakes had completely cooled, I added the frosting to all but one and swirled it with the back of a spoon, until it achieved the desired effect I wanted. With the last remaining un-frosted cupcake, I popped it into the food processor and blitzed it into crumbs (alternatively you can do this by hand) and then sprinkled them over my frosted cupcakes as decoration. 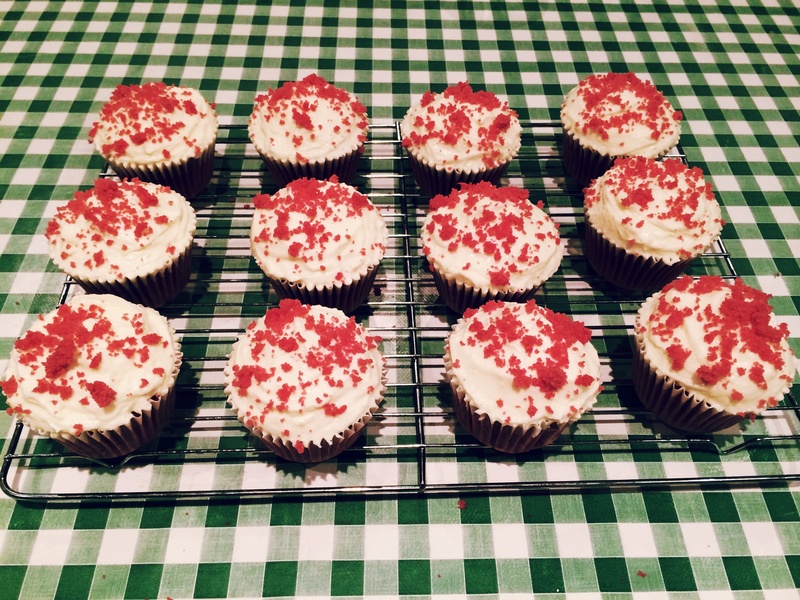 So there we have it, my second attempt at making Red Velvet cupcakes and all in all, I don’t think I did a bad job. You know what they say, practice makes perfect! For anyone who is friends with, or knows any Muslims then you’ll probably know that they have finished the month of Ramadan in which they take part in fasting. During this month, food and drink is only to be consumed during sundown hours and fasting takes pace during the day. This of course seems like utter madness considering it is the middle of summer where the days are longer and we have had a fair few heat waves! But fear not, Ramadan is over and Eid was celebrated. 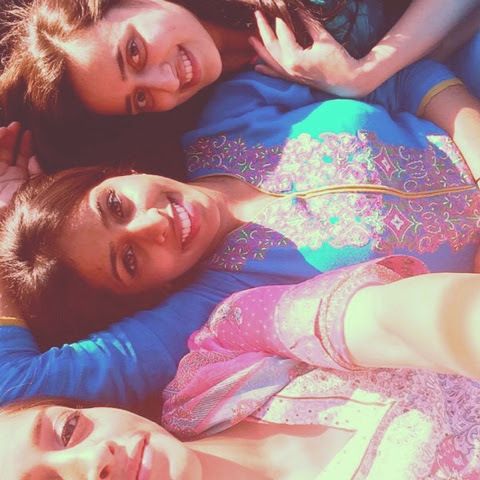 For me, Eid is a day of food, family and more food! Seriously, my family will use any excuse to have a large, lavish feast any time of the year. 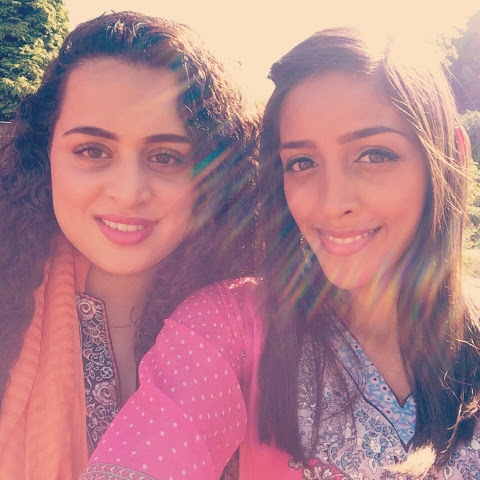 Every year, someone will take turns to host Eid at their house and everyone will do their bit of cooking, where some form of roast chicken usually features. 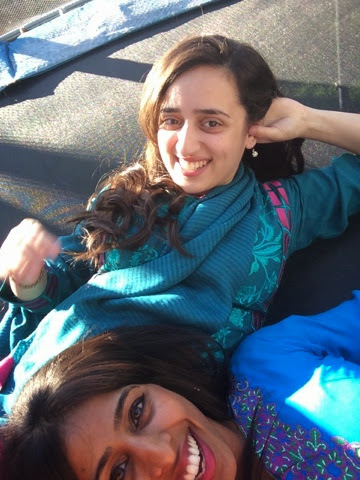 Eid is also a day where everyone will wear new and/or fancy clothes and will make an extra effort to look nice (for photos of course). 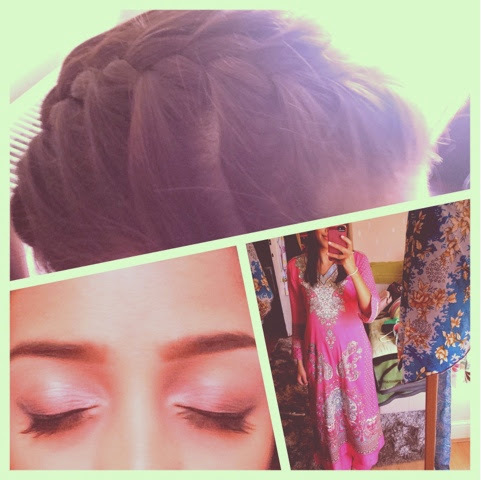 I decided to wear an outfit my sister Farah bought for me as an Eid gift last year. 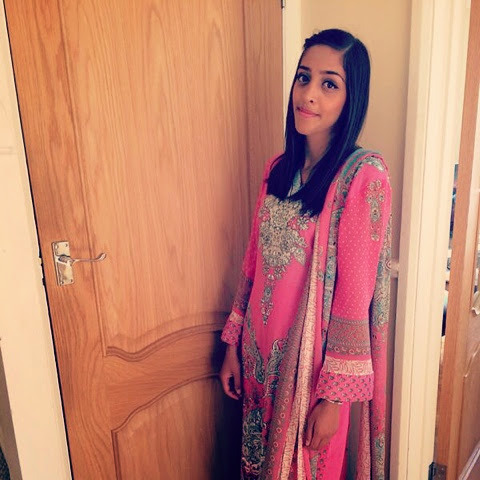 I don’t normally wear this colour pink but I thought it looked really nice with the paisley design. As luck would have it, the weather was insanely nice with blazing hot sunshine, so it was all well and good that the material of my clothes were quite thin and light! At one point throughout the day, my aunt braided one half of my head as the fringe I am currently attempting to grow out was becoming bothersome. I also dug out my Naked 3 palette to take advantage of all the pretty pink colours to match my clothes. 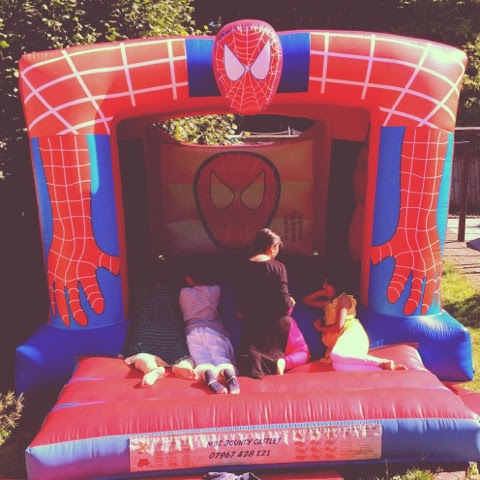 Unfortunately I didn’t take any pictures of food, but to compensate, here is a picture of the Amazing Spider-Man bouncy castle that we hired for the day. LOOK HOW AWESOME IT IS. 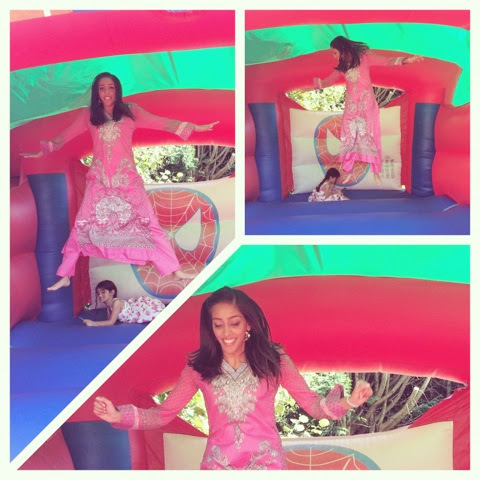 And because we’re such big kids, Naz and myself kicked the children off so we could have a go. 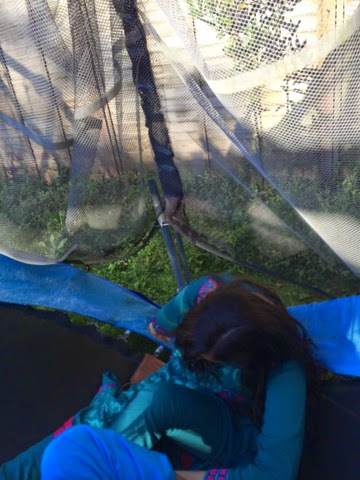 After many a selfie on a trampoline, the kids decided to raid it — needless to say, the trampoline broke and Naz and Zuli tumbled into the fallen corner (er, do round trampolines have corners?). So there we have it. 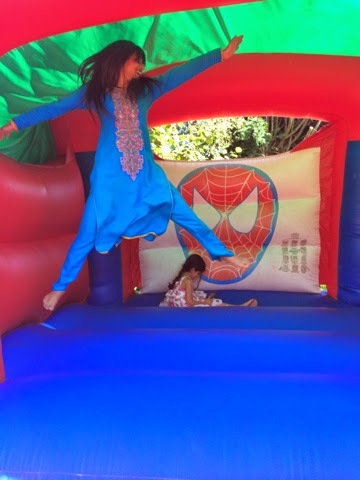 A successful Eid was had by all – involving scoffing a lot of food, a Spider-Man bouncy castle, far too many in the sun selfies and one broken trampoline. 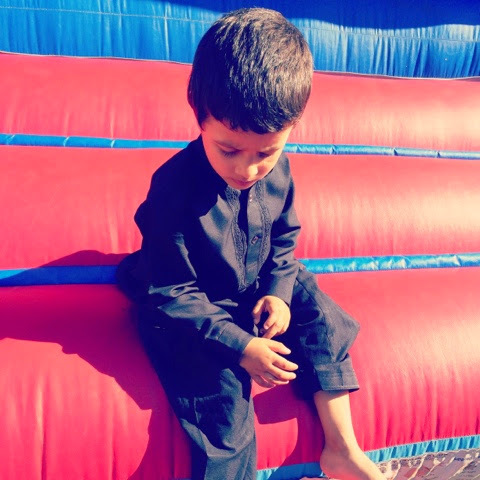 Eid Mubarak to everyone who celebrated this year!